The purpose of this report is to set the requirements that will provide directions for empowering the marginalized peoples in rural and semi-rural areas, with productive and profitable applications of new technologies. The stress is upon showing how hydrogen as a means of energy storage and transmission, can bring positive swift and lasting changes to the social and economic health of local communities. The benefits involved will relate to improved services like tourism, small industry and general well-being. What is perhaps most important in this report is its effort to provide a can-do attitude to the audience. If that happens then an exponential rate of growth with modern technology and new methods costing USD 10 trillion can raise India's GNP beyond USD 50 trillion. 1.Note: In view of the fact that this report is being prepared gratis, with no costs to the client, the author Arindam Banerjee and HTN Research Pty Ltd declare non-liability for any consequences resulting from any implementation of the ideas contained herein. This document is a project deliverable, related to letters No. : WBREDA/HFC/7(2012)/2215 dt 20/12/2012, from Shri S. Bhattacharya, Director-in-Charge WREDA and No. : WBREDA/HFC/7(2012)/615 dt. 28/06/2013, from Shri Joy Chakraborty, DE, WBREDA. These letters declare the willingness of WBREDA to initiate the introduction of the world-first hydrogen economy in West Bengal, by installing 5KW and 200KW pilot plants in certain rural areas of West Bengal. Concerned technical, political, academic, business, industry and social leaders will be contacted about the scope and potential of the Hydrogen Economy, that will be elaborated in this document. It is expected that a workshop will be held, under the auspices of WBREDA, to disseminate the new ideas and approaches to the abovementioned concerned personnel. The synergy resulting from this workshop will be channeled into the formation of the pilot plants, analyzing the outcomes from the inputs, and then expanding the scope to the larger communities. In brief, what is conceived is that surplus power from the grid (when available) and extra power from solar and renewable will be converted into hydrogen gas through the process of electrolyzing water. Water comprises of the chemical elements hydrogen and oxygen: the oxygen also generated from this process will be a by-product. Hydrogen gas can also be made from coal or other fossil fuel. With solar power becoming increasingly cheap, the price of hydrogen will primarily relate to the cost of solar panel costs including installation and maintenance. The main direct costs are the fuel cells (suitable for low power applications), and development work to convert the hydrogen into electricity using modified steam turbines (for high power applications). The latter proposal is a new idea, at the research level. No difficulty in realizing such a modified steam turbine using hydrogen to generate the steam is anticipated. Hydrogen can be converted into electricity and pure water by fuel cells, or by special steam turbines for much greater hydrogen volumes. The technology for fuel cells has improved considerably, and their costs have come down so this could be a viable and probably more reliable alternative to the solar-battery system in the near future. Local production of hydrogen (by solar power, and renewable sources) is bound to be erratic. Thus what is proposed by HTN Research Pty Ltd. is the construction of a Hydrogen Transmission Network. There, all the hydrogen stored locally will be shared by a network of pipes carrying hydrogen, like any gas network but with additional anti-corrosion character. At any site, there is either consumption or release of Hydrogen to the entire network, which is metered. The constant pressure is maintained by some sites that just keep on sending Hydrogen into the network. Such sites could be those converting the surplus electric power from the existing grid to hydrogen gas. A one-page drawing of the scope of this proposal is presented as Fig. 1. The benefit to society will be a pure environmentally friendly, cheap, easy to repair, rugged, energy-pilfer-free, no-copper-stealing, efficient, reliable (7*24), flexible, natural disaster-proof, modern high-technology yet user-friendly energy generation, transmission and storage system which will be a world-first step is breaking away from the clutches of the oil economy. The success of the pilot projects will naturally lead to the mass production situation, involving the transition from the present fossil-fuel based regimes to the hydrogen economy sustained by the Hydrogen Transmission Network. 30 million 5KW units have to be constructed and linked by the HTN. The cost of that whole project to transform India most rapidly from its present state to a state (like one huge Singapore) which would surpass every other nation by far in terms of economic strength is 30,000,000 times Rs 2 crore or Rs 6 crore crores (Rs 600,000,000,000,000, USD 10 trillion). The resulting increased Indian GNP, following the efficiency shown by Singapore, will be USD 58 trillion. i)To suggest further development plans principally using technology houses such as MECON to lead and do the projects making suitable alliances and partnerships. a)Financial Support. Once the workshop is completed, and basic approval obtained from the concerned parties, there is need for further work relating to publicity and obtaining funds. Primarily, it is expected that NGOs and concerned individuals will put up some start-up funds. It is expected that Governments, Banks, Industries, Individuals, more NGOs etc. will participate in due course once the project makes headway. It is necessary to form a Finance Group (composed of volunteers, paid workers, Govt. staff) that will be in charge of obtaining, managing and allocating the funds to various parties. b)Technical Support. It is best that the entire handling of the project is left to a technology house, which will cost the works done and bill it to the Finance Group. India has many competent engineers and technicians. Their skill levels are adequate for the quality of technical work that will be involved. c)Social Support. It is necessary to organize a group of volunteers and Govt. officials (local, state and Centre) to monitor the process and provide before-and-after situation reports in the social and psychological sense to declare the worth and efficiency of the pilot projects. d)Economic Analysis. The local economic status of the population has to be monitored for the before-and-after situation, in terms of the taxes collected before and after, the number of jobs created, wealth increased from activity such as tourism and small industry so as to declare the success of the project. Comparison needs to be made with respect to the quantity of similar investments made in other areas. Cost-effectiveness analysis for the pilot project, as compared to other ongoing systems such as providing 7*24 grid electricity, and 7*24 solar-battery system, need to be done. Real estate price escalation, asset purchases, etc. will have to be monitored to show whether or not the investments in the pilot plant projects will have made a significant and lasting impact. Natural development of the hydrogen economy will follow, if the economic analysis is positive and given due media publicity. a.Hydrogen is a dangerous commodity, as evidenced by the fire that took place in the German airship Hindenberg in May 1937, where 36 people were killed out of a total of 98. This incident is much used by the oil companies to put down the rise of Hydrogen as an alternative fuel. Nowadays regulations exist to prohibit the use of Hydrogen as a fuel. b.Hydrogen is more expensive than other fuels. c.Fuel cells are unreliable, expensive and dangerous. d.Hydrogen is a light gas, and will leak. It takes more volume to store. e.Sending hydrogen via pipes is more expensive than current power line systems. f.Hydrogen pipe lines can be subject to terrorist activity. g.Solar/battery systems have been around for a while. h.At the theoretical level, a solar power plus electrolysis system that will keep on generating hydrogen indefinitely using salt or brackish water, amounts to the creation of a perpetual motion machine! This violates the laws of physics and so this idea is theoretically flawed. i.No one else has done it. Perhaps it is irrelevant to point out how many people have been killed by accidents caused by non-hydrogen ships since 1937. Safety standards, materials, engineering methods have improved drastically, and thus the non-use of Hydrogen as a fuel and a means of air transport cannot be justified. Legal initiatives must be taken to redress this most unfortunate outdated situation. Most hydrogen is produced from fossil fuels today, and that accounts for the higher price. When hydrogen will be produced from solar power and other renewable sources, and using just sea-water for electrolysis, the costs of hydrogen will depend upon the costs of solar power - which is getting increasingly cheap, with recent advances in the technologies of solar panels. Thus the price of hydrogen can only decrease. 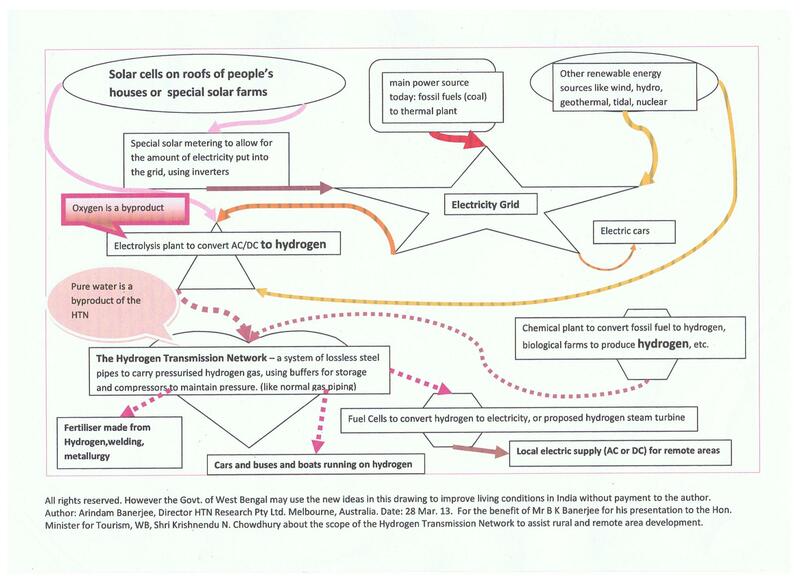 At the rural level, where the hydrogen is locally produced using local water, sun and electrolysis, the normal costing routine does not apply. Fuel cells have been given a bad name, like with the help a popular James Bond film. Actually they are not dangerous; they are getting increasingly cheap and with less maintenance requirement than normal batteries, they have good reliability and a long life. It must be admitted that fuel cells usage constitutes the weak point of the Hydrogen Economy. They are costly. But with more demand for them, the costs are bound to come down. They are the technology of the future. Certainly Hydrogen is a light gas, but it can be contained with special plastics and glasses to prevent leakage and corrosion in piping and storage applications. Hydrogen gas has been successfully piped for commercial chemical purposes in many parts of the world for several decades. Published research shows that energy transmission using hydrogen is roughly as costly as conventional high-voltage systems. In the Indian context, given pilferage and stealing of copper, along with voltage outages and breakdowns from environmental disasters, reliable energy transmission using hydrogen is probably going to be much more cost-effective. Terrorist activity may be directed at anything - trains, buses etc. are more inviting targets as opposed to cutting some steel pipe that can be soon fixed. Solar-battery systems have not proven satisfactory. Surplus power cannot be stored, nor transmitted - so the energies obtained must be localised. Batteries need maintenance and have a finite life. Batteries cannot provide high power applications like say welding and furnaces or even appliances such as hot ovens and big refrigerators. Hydrogen when available can be used for welding and furnaces, and can be used to power large ovens and refrigerators. Solar power is now very widely used all over the world - it draws energy from the Sun, and if anything around resembles any perpetual motion machine, that is our Sun! Further, use of Hydrogen is most environmentally friendly. Politicians love to talk about the need for protecting the environment, yet curiously they do not promote the hydrogen economy. So, the hydrogen economy has not taken off yet - there is far too much opposition from the vested interests. In developed countries there is already enough energy from thermal, nuclear, wind, solar, hydroelectric, etc. There is no need for a new energy transmission system, as the solar cells are connected to the already existing electric grid. Metering is done to pay the user for the surplus power he provides to the grid. The real political issue for the thirdworld politician is to expand the electricity grid into the rural areas, or to construct the Hydrogen Transmission Network instead. It would appear that at least in the areas where constructing the electricity grid is difficult, or pointless, or prone to theft, laying down steel pipes to carry hydrogen gas, or natural gas, is the sounder choice. Economic and Resource Issues: It is not a wonder that the oil companies unite to pull down and demean the scope of hydrogen as an alternative fuel. Hydrogen usage will diminish the need for fossil fuels. One will not have to pay huge sums to the oil companies - there will be savings in foreign exchange and much less pollution, less foreign manipulation, and better technology. Coal can be converted into hydrogen using well-known chemical processes. Coal is abundant in and around West Bengal. The scope of coal mining will not be diminished by the hydrogen economy. The hydrogen pipes can carry coal-gas easily (but not the other way around). The materials involved for piping will be cheap steel and plastics - not worth stealing unlike copper. Pilferage of hydrogen simply cannot happen the way electricity is stolen by tapping. Proper metering functions will totally avoid cheating; thus proper accounting can be done. This rugged and reliable system, when fully operational via the Hydrogen Transmission Network, will give 7*24 power to the consumers. It will become the backbone for further economic development. It is unlimitedly scalable. That is, it will expand or contract easily with demand. The direct costs involved are the fuel cells, compressors (for storing the hydrogen), electrolysis plants (these could be pretty simple and basic), and the storage buffers (tanks). They can be purchased off the shelf. Thus the project can get a quick start and a quick finish - there are no surprise, and no special research and development. Once the costly elements are identified, cost-reduction techniques (local manufacture, mass-production, etc.) will be aimed to reduce the costs. The hydrogen economy (using electrolysis) has as added bonuses pure water and oxygen. Generated at the electrolysis stage, pure oxygen can be used in welding, furnaces, medical and chemical purposes. At the consumption or fuel-cell stage, pure water is generated as a by-product. The availability of pure water in the rural areas, happening by converting salt or brackish water, will be a boon indeed as a versatile resource. creation of the various groups mentioned in para 2.3. Overlap in functions is only to be expected. It would be highly arbitrary of the author to provide the dates for such an exercise in a Gantt chart. However, it seems reasonable to think that the entire process should not last beyond 6 months. This document will provide the guidance required for the establishment of the Hydrogen Economy. From humble beginnings in the most remote and underprivileged rural areas of West Bengal, the Hydrogen Economy is expected to expand very rapidly, using the methods underlying the proposed Hydrogen Transmission Network. Many businesses and jobs will be created or expanded; many who have nothing today will be empowered with hope and scope for action. The gains from this new initiative are underlined in both qualitative and quantitative terms. This document will not provide a set of blueprints for the 5KW and 200KW Hydrogen Economy pilot projects. That final set of documents will have to be provided by the funded parties that will directly supervise the construction of the projects. Technologies and costs change rapidly. Political and other factors relating to efficiency and reliability have to be considered. Based upon the ideas and methods provided in this document, and further inputs from the concerned stakeholders, the project engineer concerned would need to draw up the engineering details from the latest sources. This is a high-level document. It stresses upon delineating the original ideas involved; the need for same; their implementation style; and the outcomes as opposed to elaborating and analyzing the nitty-gritty technical and cost details. The technical details will not be ignored, but they will be sketched out as opposed to drawn out with engineering details. Very often, this question is raised: "Why is India not doing as well as certain other countries? What is the problem?Б─² The answers have been many and varied, and blame has ranged from the hot climate (Nirad Chaudhuri, in his book "The Continent of CirceБ─²) to the debilitating effects of incorrect appreciation of ancient Indian religions, philosophies and traditions. Practically, there are many negative factors, like region, language, caste and creed issues creating disunity; lack of entrepreneurship and good leadership; poor quality of wealth-making education; adverse foreign relations at least locally; unhelpful international trade and currency regimes; bad publicity; brain-drain and so on. It takes one to step out of India, for an extended period, to understand the real situation by comparison with other nations that are considered to have done better than Indians. I have lived in Australia for the last 24 years; and in India for the first 33 years of my life. Thus I am in a good position to comment upon the differences in styles between the so-called thirdworld and the much vaunted firstworld conditions. While there are many aspects of life in Australia worthy of admiration and emulation, the true strengths of Indian thought and life styles are even more admirable, even if not given enough attention. To complement the latter with the former, for the overall good of Indian conditions that will eventually diffuse globally, is one main goal of this work. Indian thinking is steeped in compassion based upon absolute truth. For example, it is well-known that everywhere outside India an extraordinary amount of animal life is killed, processed and sold for food. There is no doubt that such meat-eating habits impact very favorably in the GDP-boosting tables and charts so valued by economists. Outright destruction of the land, by mining, deforestation, poisoning by chemicals; various forms of piracy; environmental vandalism also boost GDP figures as agricultural, sales and industrial outputs consequently show increase. There is something deep within the Indian consciousness that resists the snob appeal of GDP ascendancy attained by cruel and unscrupulous methods. The net result is, that while in economic estimates India does fare poorly, in terms of moral and spiritual wealth India remains supreme among all nations. It is with the above viewpoint that we shall address the meta-issues of energy usage, involving sourcing and transmission. The points made below are not obvious; they are abstract. Nevertheless, they remain of the highest importance. There is something about mined fossil fuel (oil, coal) that the Indian mentality rejects. Apart from the costs and pollution, there is, I suspect, an intrinsic factor about their lack of renewability that irks the collective consciousness. Historically wood and charcoal (both renewable forms of energy) were used for domestic and industrial energy sources. Scarcity of timber, and a much larger present population, has enforced change towards fossil fuel usage for energy, with a grudging acceptance of this foreign method. But the underlying psychology of the population has not changed - not to spoil or use up matter on a permanent basis, but to recycle instead, indeed gives priority to the need for renewable sourcing for energy. Similarly, there is a tacit and implicit discontent for the standard methods (High Voltage, Local Current Loop) of power distribution among the general Indian public. The power distribution system, with its blackouts, transformer blow-ups, load-shedding, low voltage, poor billing and collection systems, has never been popular. Most serious companies have captive power plants as the electric grid supply is not reliable. Now why has this peculiar situation happened? Such is not the case in the firstworld countries! And on top of this, there is the theft of electricity by "tappingБ─², and stealing of the copper! P = y - x/e. The efficiency factor e relates to the confidence the people have in the reliability of the electric supply, as such confidence will enable them to invest in electric appliances and the related methods and businesses. So, if we do have 100% power because there is low demand owing to loss of industry and business, that will not mean that e should be set at 1. Because then people will know from the installed capacity that as soon as demand will pick up, then again shortages will be felt. So the e value not only depends upon the availability of electric supply on the regular basis, but also on the installed and potential capacity. When e = 0, meaning no power at all, P will be minus infinity and will imply absolutely no gain from electricity for the user and the local community; rather, they are effectively losing money in the global marketplace as they could be making money if they had electric power. When e = 0.5, we will have P = y - 2x which will mean that there is less profit, or even loss when P is negative. The point of the small mathematical exercise done above is to show that when we talk about the cost of providing electricity, in terms of just rupees per unit, we do not take into consideration the enormous cost of NOT providing electricity on the regular basis. But, as we have just seen, not providing electricity on a regular and reliable basis effectively does increase the effective cost of electric power, to the extent that its use is marginal and unproductive. Appliances like refrigerators, medical equipment and air-conditioners simply cannot work unless 100% supply is guaranteed. Their non-use reduces the gain term y in the above equation, which reduces the profit P. With less profit, the need to buy appliances gets attenuated, and this harms business and development. This is a vicious cycle, which must be broken if ever prosperity has to come to the people. It will be easy to blame the electric supply people and the errant "consumersБ─² of the supply system, and extend that to some malformation in the "national characterБ─². I have heard this often enough, while I lived and worked in India and suffered from power issues as all Indians did. My stay abroad has convinced me that Indians are no worse than other people in the developed countries. Proper procedures with suitable funding maintain the power systems, and effective policing and jailing enforce the laws there; India with its comparatively limited resources simply has not come to that stage to check effectively the opportunism and unscrupulousness of the miscreants. On the other hand, the limitations of the electric power distribution system are thoroughly exposed in India. Such a system may well be good for the firstworld countries, but evidently in India some system that is far superior is desired. Thus it could well be that the discontent as discussed earlier, has more to do with the intrinsically inferior nature of the electric grid power distribution system as opposed to the flawed nature of the Indian public. In which case, a better system to distribute energy is required. Appendix 1 gives the patent and other relevant details of the Hydrogen Transmission Network. Here we will talk about this new invention in brief. As opposed to High Voltage Alternating Current, dependent upon transformers and towers and transmission lines spanning long distances, the Hydrogen Transmission Network is a system of special steel pipes - containing a special plastic/fibreglass inner lining to prevent corrosion - containing hydrogen under pressure. For the Hydrogen Economy, all forms of renewable energy, mainly solar, may be considered for conversion to hydrogen. Energy from wind, nuclear, hydro, tidal, geothermal are also eligible. In certain cases, or as a supplementary source, power from the electric grid could be converted to hydrogen. In all such cases, the process of electrolysis (passing a DC through saline water) will be used to create hydrogen and oxygen as a by-product. Coal or other fossil fuel could be converted to hydrogen directly. Special hydrogen collectors, compressors and containers will be used to collect, pressurize and store the hydrogen in buffers. These buffers will be connected by the steel pipes over varying distances. The steel pipes will branch out to various outlets for hydrogen energy usage. Thus, buses, boats and cars may run directly on hydrogen fuel; similarly industrial welding action and small special furnaces could use hydrogen directly; as also fertilizer industries. However, as a replacement for electric supply, the hydrogen will go as the input of a hydrogen fuel cell, that will use oxygen from air to combine with the hydrogen to produce electricity (low voltage DC) and pure water as a by-product. To initiate the Hydrogen Economy, pilot projects involving generation, storage and usage of hydrogen at a particular locality have to be created. Solar cells will convert solar power to electricity; electrolysis will convert the surplus electricity (that amount not being used by electrical appliances) into hydrogen and store the hydrogen in special containers (buffers). At night, or when solar power does not generate enough electricity, fuel cells connected to the buffers will generate electricity, till the hydrogen runs out. This may be seen as an alternative to the solar cell/battery combination which has been shown to have many limitations. It has been anticipated that there would be extreme fluctuations in the quantity of hydrogen stored in the buffer at any given time. With much more solar power than needed in the day, there would be available a great deal of hydrogen, and vice versa. Solar power will be proportional to the quantity and quality of solar cells installed, the condition of the weather and the presence of the sun. So there will be times when the buffer will be empty and that will jeopardize the 7*24 goal of electric supply. In order that there will always be a 100%, 7*24, or e=1 supply of electricity with the Hydrogen Economy, it is most necessary to construct the Hydrogen Transmission Network. Simply put, it means that all the buffers are now connected by a network of steel pipes carrying the hydrogen under pressure. At the generating end, in a particular buffer, or some dedicated buffers, hydrogen is being continually put in (say from a chemical plant converting coal to hydrogen, or an electrolysis plant using grid electricity) so there is always a supply of hydrogen to all the buffers, irrespective of the local condition. At any user site, hydrogen is put into the HTN when there is surplus; and hydrogen is withdrawn from the HTN when there is a deficit. The Hydrogen Economy will be a grass-roots economy, focusing upon the needs of the people. This will be totally different to the top-down energy schemes dictated by bureaucrats and politicians. In the Hydrogen economy, the users will be in total control of the whole energy generation, use, storage and transmission. Because the hydrogen economy will answer and address the peoples' needs, they will feel more empowered. As they find the hydrogen economy improving their lot, their faith in the technology will increase. Thus they will be in a better psychological state to protect and take care of all the technologies involved. At another level, there will be no market for steel pipes that will carry the hydrogen from one site to another. Thus, the steel pipes will be free from pilferage. It will soon be found that hydrogen cannot be stolen in transit, as is done for electrical transmission by "tappingБ─². Thus, the HTN will be naturally pilfer-proof. The great success of mobile telephony in India is largely due to the correct and efficient billing systems, involving pre-pay. Collecting bills is bypassed, with this method. In the HTN, the net amount of hydrogen put into the network, and drawn from the network, can be found easily by metering. So a particular site will be billed or paid as per usage or creation of hydrogen. It will be found that the 7*24 availability of energy will create a number of jobs, as electric appliances will become increasingly used. The particular rural area will become the hub of local attention. In later paragraphs we will develop upon this theme. With more jobs, more facilities, there will be appreciation of the real estate with increased satisfaction, and more money flowing around the community. The before-and-after metrics (in the area corresponding to the pilot project schemes) will need to be measured and given publicity. It has to be seen, from the experimental data, how much invested money has resulted in how much ongoing economic boost. This information relating to return on investment will be crucial in the expansion of the pilot projects, to the larger and wider rural communities. Co-operatives or entrepreneurs could take loans for implementing the HTN, on the understanding that its implementation could mean increased real estate prices, more local industries making profit, better transport and tourism, etc. It is thus expected that the pilot projects, carefully executed and publicized, will lead to a situation where the development of the HTN as the key means of implementing the Hydrogen Economy will become a natural process with its own life - like the successful mobile telephony network, internet, banking, postal services... With the availability of 7*24 energy everywhere, the progress towards greater and increasingly better services and conditions will be inevitable and unstoppable. One of the most relevant arguments against the Hydrogen Economy is the real problem of Hydrogen storage. Hydrogen storage at any site is a bulky process, and also leaky. This problem has not been sorted out. With the Hydrogen Transmission Network, this problem is bypassed. This is because most of the hydrogen generated is used up almost at once, with no need for storage. The storage buffers exist only to stabilize the supply and adjust with the demand; thereby providing a constant and unfailing supply. Another argument is safety. Hydrogen is a dangerous gas, but it is not much more dangerous than natural gas. If natural gas can be piped around then so can hydrogen. Chemical engineers assure us that the transmission of hydrogen using special pipes has been done safely for over 60 years, and thousands of kilometers of such pipelines already exist in Europe and USA. This DPR from the implementation-model point of view will be based upon the Australian rural model, as it has been proven to be the most successful in terms of providing the highest possible quality of life to people in such rural areas as match Indian conditions in terms of climate. Unlike other developed and large regions like say Canada, Northern Europe and Russia, Australia is not frozen - it has a warm climate, like India. The fact that English is understood in both India and Australia will be a great aid in promoting development. In cultural and sporting terms there is a great deal of mutual understanding from the Commonwealth heritage, tourism, business, emigration, and of course the game of cricket. Finally there is a lot of interest in Australia about India that I have had the pleasure to experience, and that interest may be put to good use. A pioneer would arrive, with or without a family, in a cart drawn by horses and with some necessary tools, like spade, saw, axe, knives, saucepan, ropes, hammer and nails, etc. He would cut down some trees and use the wood to build a log home. He would surround it with a kitchen garden. He would also raise chicken and pigs. Later on, with more land acquired, he would raise sheep and cows. Working very hard, he would make cash crops like sugarcane, which would be converted into sugar or rum. He would work for the more settled people for wages or provisions, or expand upon his land with additional help (white slave labor - convicts from England). In due course entire hills would be denuded of trees, and replaced by pasture. The more arable pastures would be used for agriculture. Small dams would be built. If there is a creek, a watermill could be created. A windmill could be created to pump out underground water. With increasing prosperity, the log home would be replaced by a proper home. By this time the track would be replaced by a better road. More houses would also be built locally. So the next step would be for the state or the larger community to step in, to provide services. A post office would be the first and most central element in bringing the merits of civilization. Apart from doing the normal postal work, this post office would also act like a mini department store. It would also act as a cafц╘ of sorts and thus sell sandwiches, cakes, etc. and have provision for tea, coffee and drinks. The postmaster would be a mine of information for both the locals and visitors. Legal forms, addresses and contacts to the external world, scope for advertising, would all be found in the post office. In short, apart from providing postal services, the post office would be the unitary place supplying the local needs, based upon current demands. With time, the functions of the post office would become diversified. A hotel would be constructed, providing a restaurant, bar, facilities for gambling, overnight stay, entertainment, etc. A church would also be built, along with a community building. Separate department stores selling general goods would come up around the post office and the hotel; then there would be shops for blacksmiths (repairing carts and shoes for horses); wooden mills for processing timber; butcher and baker shops; grocer and greengrocer shops; candy shop; clothing and tailoring shops; boots and hats shop; pottery and furniture shops; along with shops providing services like hair-cutting and mending. With increased population, a school would come up. Then a police station, and perhaps a law court and hospital. Finally, agencies from banks and insurance companies would set up shop - this marks the final stage of rural development. Once financial institutions start playing their roles, small companies would start up and keep on expanding their various roles in industry, agriculture, food, entertainment, sports, health, music, business, tourism, transport... With even more development, factories, jails, libraries, secondary schools and technical institutions, more churches and sports stadia, cemeteries and many more kinds of shops would be created. It would appear from the above that starting just with some hand tools and plenty of hard work and determination, a marvelous standard of living would be created in a relatively brief time span! While the above is largely true, there are other factors for the success in Australia. A continent deemed to be uninhabitable by the Dutch, who first discovered it, is now worth many trillions - as a sum of real estate, buildings, roads, mines, services and institutions! So what are these other factors? How has so much money come from nothing? These are the deep questions that should interest us, as we analyze the Australian model as the basis for rural development in West Bengal, taking the local conditions into consideration. An extraordinary unity, and propensity for mutual benefit (helping each other to do better instead of trying to pull each other down) is a key characteristic of the Australian character. This unity comes from many sources: the harsh Australian environment (little water, low population, vast distances, floods, droughts, temperatures usually very high, cyclones) can be unforgiving so helping each other is a necessity while meanness and backbiting is a luxury that cannot be afforded; a common racial and linguistic background making understanding and communication easy and simple; faith in God and community bolstered by meetings in churches and community centres; regard for law and order; strong family and national values. Giving priority to transportation, on both the rapid, bulk basis for goods and for personnel. Rapid development was possible by making good, wide roads carrying goods and people, and using boats and ships for transport wherever possible. Rapid and bulk transportation facilities was matched by swift processing of goods, and delivery of services as quickly and efficiently as possible. The notion of delaying matters in order to prolong the job for whatever reason, is foreign to the Australian consciousness. No consideration for the good of the environment, when profit is concerned is lamentable no doubt but such environmental vandalism has undeniably been good for the economy, at least for the short time. Indiscriminate tree-felling, hardening of the soil by cattle and sheep hooves, killing of many animals, destruction of natural flora and fauna, diversification of natural water flows for agriculture, pollution from coal burning are some examples. While there are restorative measures like reforestation, to begin with there was no mercy at all. Efficient and keen valuation of property is an ongoing process, and very important indeed! For it is upon the worth of an individual's or company's assets that loans are obtained. Building upon the loan obtained, with continued hard work, insight, imagination and also good luck against the inevitable risks, the borrower expands his assets and earnings base and becomes eligible for more loans while at the same time has his net worth increased. licenses (more licenses given, more need for investment money as more jobs will be created), etc. With the hard work done by those who take the loans and build upon them, the loan money which did not have actual existence to begin with now becomes reality. In other words, the loan is given to the money-making potential within the worthy population - worth being defined as a combination of youth, activity, foresight, planning, learning, desire, family values... The person who takes the loan is forced to work hard and plan carefully, in order to be able to repay the loan. Thus, the loan automatically enforces a coercive effect, more powerful than the threats and entities in the normal wage-based situation. Work is thus not delayed - it has to be done, for pure survival and then, expansion. Those who cannot pay back the loans suffer - they get bankrupt, suffer ill health, have family problems. Their assets are taken over at a very low price in auction or grabbed by bailiffs for the repayment; those who have the money to profit from such misfortunes do very well for themselves and the overall economy. We are now in a position to see how the wealth in Australia has been created. In short, the hard and good work by individuals and groups are matched by money created from paper or base metal, and this money is a measure of that work and the assets formed from the work. The more efficiently, the more soundly and rapidly such work is done, leads to the creation of more money - and this movement multiplies. There are checks, like wars and natural catastrophes, but so strong is this automatic money-making process, that so far it has triumphed over all vicissitudes. The modern electric age has simply made all the positive aspects of money-making in Australia even more prominent. Work is done much faster with electrical machinery; money flows much faster as there are very many transactions made in the electronic age; banking systems are very efficient. Whatever the Australians did in their pre-electricity age, they are doing the same only much better and with more variety and luxury. In my opinion, they richly deserve the leisure and joy from their success. The scope of the 5KW power plant and the 200 KW power plant has the Australian experience for the technical and social background; that is why the Australian experience has been described in so much detail in the earlier sub-section. Unlike Australia, India has a long history and settled urban civilization going back for thousands of years. Thus a good deal of the Australian experience will not be relevant for Indian conditions; nevertheless, to provide overall meaning in terms of conditions and development in the pre-electricity situation, a succinct account of the successful Australian experience has been presented so that suitable filtering may be done as per the particular needs of the West Bengal rural conditions. Thus, tree-felling, grazing, meat-eating, destruction of existing flora and fauna are irrelevant factors for Bengalis. Similarly, the needs of the average Australian in terms of inhabited space, and goods (cars, machinery, gadgets) that he must have for sheer survival, are not directly comparable. India is vastly more populated as compared to Australia, and Indians can manage with a lot less. The high population density means no vital need for cars and huge trucks for transporting people and goods; proper public transport is a far superior option. Again, it is not necessary to stress the role of capitalism and banking for rural development in the Indian context. There is an underlying cruelty and stress involved in the repayment of loans - many unforeseen negative events may happen and could cause disaster to good people. A far more co-operative, safe and stress-free work and life environment based upon the socialist values enshrined in the Indian constitution is naturally appropriate for the Indian situation, which is characterized by kindness and compassion. Progress depending so much upon stress will be fast and sure - but what will it be really worth? Do we really want to live in a world of stress relieved by medicated drugs, and continue that style to our descendants? Not putting emphasis upon loans and their repayments means avoiding a host of problematic and expensive issues: police, lawyers, bailiffs, jails, insurance payments, medical complications, personal problems... these are the negatives of the Australian experience that may be overcome with warm social feelings of brotherhood and charity. Let us hope that feelings of brotherhood and charity will foster the development of the Hydrogen economy. Now, let us filter out the positive aspects of the Australian experience and see how much they can be implemented in our 5KW and 200 KW plants. We will be making a grass-roots demand-based assessment of the electrical appliances most necessary for use in the West Bengal rural situation, for the most rapid and effective expansion of the Hydrogen Economy. Once that has been determined, we shall consider the source end - how many peak kilowatts of power need to be generated overall, how much of that can be stored and the rest used directly for immediate consumption, the way to capture the surplus power, and finally how to send and receive the surplus or deficit power at any given site. From the section 3.4.2, it should be obvious that the post office should be the main target of attention in the development of the Hydrogen Economy. Today most rural post offices in India have very little by the way of extra facilities. The role of the postmaster in the rural setting has to be expanded following the Australian experience. Along with other key local people (teachers, health-related personnel, social workers, business people, agriculturists) the postmaster should set the example by incorporating new ideas in his environment. New goods and services for the rural community have to start from somewhere, and the post office seems the ideal location. It is not a wonder that the actual geographical centre of any populated location in Australia is the post office. When we talk about a 5KW plant, we mean that 5KW of DC power output will be the output of a fuel cell. A constant supply of hydrogen gas has to be given as the input to the fuel cell. 7*24 availability of electricity will be there so long as this supply exists, barring the regular maintenance downtime. Because this supply of hydrogen in theory can be unlimited (with extra physical storage or downloaded from pipes using the Hydrogen Transmission Network) this plant will be intrinsically more sound and reliable than the battery-powered systems in rural areas. What the 5KW fuel cell will do is to provide a constant 5KW of DC power at night from the hydrogen generated by the day, by electrolyzing the water with the electricity derived from solar cells or other forms of energy (wind, tidal, hydro, geothermal, etc.) Enough hydrogen must be stored to last the fuel cell usage over the night. However the supply of solar power even in day is erratic, thanks to bad weather and clouds. With bad weather and clouds, the efficiency of solar cells goes down to as low as 2-5% of normal capacity. Thus, to supply the fuel cell over the night for the 5KW fuel cell it is necessary to have installed solar capacity of at least 150 KW. With such a capacity, it will be statistically possible to have 7*24 electric supply to the post office - and this will be a most vital step to the development of the Hydrogen Economy. 150 KW solar panels will be made from around 600 panels each generating around 250 watts in normal conditions. The area for each panel will be around 1 square meter, thus 600 square meters of clear area (30 m by 20 m) is required. In the rural situation, where space is not the issue, there should not be a problem to create such a solar harvesting farm. A clear area of say 40m by 30m needs to be found, near the post office. The solar panels need not be located at the same place. They could be mounted on roofs of people's houses, and spread out. Now let us do some simple mathematics. Assuming 70% average efficiency over the day, on the normal basis, and only 8 hours of solar existence per day, for a 150 KW solar farm we shall have generated 840 KWH (units) per day. These are conservative figures. To run the 5KW fuel cell for say 16 hours we need 80 units. These 80 units of power must come from the 840 KWH generated. There will be conversion losses (electric power to hydrogen, and from hydrogen to electricity) and this loss is of the order of 60% - 70% as will be quoted below. The following gives the worst-case scenario about conversion losses. The loss figure is matched from other sites. When asked by our friends at Plug In Cars about his stance on H2 vehicles, Krebs made an argument that we will be interested to see discussed more in the future. "Hydrogen mobility only makes sense if you use green energy," he said, but when you start from there, you need to convert it first into hydrogen "with low efficiencies" where "you lose about 40 percent of the initial energy," he said. Then, you have to compress the hydrogen to 700 bar and store it in the vehicle, which costs more energy. "And then you have to convert the hydrogen back to electricity in a fuel cell with another efficiency loss," Krebs said, "so that in the end, from your original 100 percent of electric energy, you end up with 30 to 40 percent." Taking the worst case 70% conversion loss, the input energy needed will by 80/(1-0.7) = 80/.3 = 270 units. We have seen that on the average daily 840 units are generated by the 150 KW solar farm. Statistically we may show that the chances of generating 270 units are pretty low - on the average we will be getting 840-270=570 units of energy a surplus. Of this energy, naturally 40 units will be for the post office for day usage directly. After that, as much as 570-40=530 units, a very significant amount of energy, will remain unutilized during the day! What will happen to it? Obviously, those 530 units could be used to run electric appliances during the day. However this supply will be very erratic. There is no grid that it could be fed into, the way it is done in my home in Australia right now! The best option would be to convert that to hydrogen and store it. This hydrogen could be used for many purposes directly without need for conversion to electricity. Such uses are for transportation (Hydrogen buses have been trialed with success in Australia); making fertilizer; welding; small furnaces for metallurgy. Or, standard lead-acid batteries could be used to soak up the extra power - these batteries could discharge in the night-time. It is perfectly possible to have the solar plant with electric batteries co-exist with the electrolysis plant-fuel cell system; however, in the long run conversion of all renewable energy to hydrogen is likely to be the most favorable option. Thus, we need to have an electrolysis plant that will handle 150KW of input power, and sufficient storage facilities for the hydrogen. Water filtered for solids is required for electrolysis - saline or brackish water will do very well. 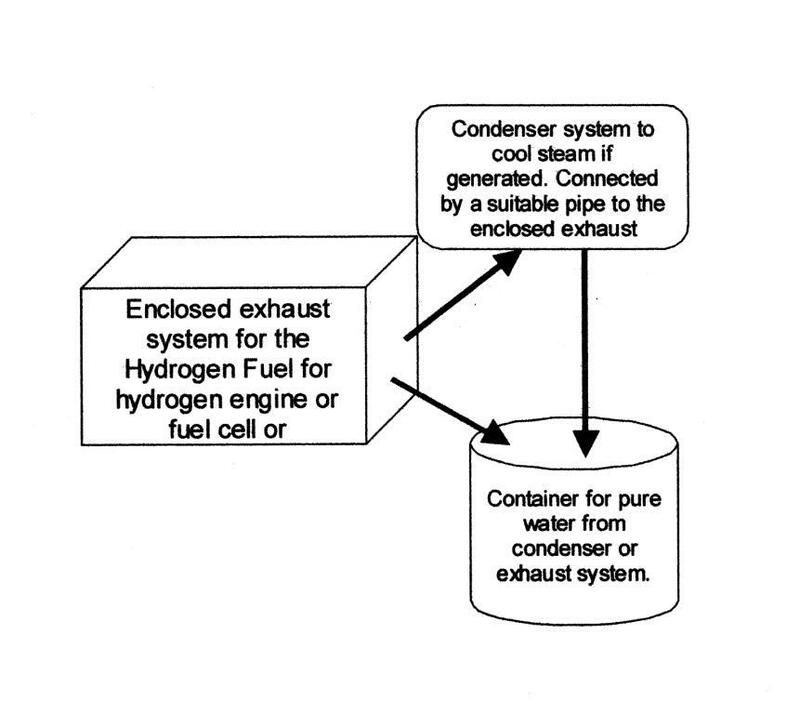 Hydrogen generated will be compressed using a compressor and stored in a suitable storage tank with connection to the fuel cell and additional possible connections to the future hydrogen transmission network. The fuel cell will be connected to an inverter which will generate the steady 220 VAC to run the appliances. pure oxygen, from the electrolysis process. This oxygen also could be stored as used for medical or industrial purposes. For instances, very high temperatures could be reached in special furnaces/burners by combusting hydrogen with pure oxygen. Working with difficult metals like Titanium could be thus made possible, even in the most rural areas. pure water, as a by-product will be formed by the conversion of hydrogen to electricity, when the hydrogen reacts with the oxygen in the air to form water. When suitably mixed with the required minerals, this pure water will be a great boon in the rural areas, for drinking, industrial use, soft drinks industry. It can be argued effectively that these two very useful byproducts more than compensate for the comparative loss in efficiency for the fuel-cell case with respect to the battery case. In any case the loss of efficiency is made up by placing more solar power panels - with solar power panels becoming increasingly cheap with revolutionary technologies that will soon print them out this is the natural option. In addition, with the hydrogen economy option we have rapid upgrade capability, all-round reliability, higher power outputs for industrial use, scope of making fertilizer, flexibility and range of usage especially for transportation. We now check what sort of electrical appliances need to be run on a 7*24 hour basis in the post office premises. The most obvious with high power need is the refrigerator and the freezer (less than 3 units). Needing less power is the television, and outlets for charging batteries for visitors. The radio and music systems are also there (less than 1 unit). Finally and most importantly we need lights for illuminations, and fans for comfort (less than 1 unit). With such usage of electricity, the humble post office will now have the backbone of its Australian counterpoint. At night, it will shine brighter than the stars, play music, show television to the public. The refrigeration can hold soft drinks, milk, fresh vegetables, eggs, yoghurt and the freezer could hold ice cream, fish, and other perishables. It may well be expected that this new phenomenon will attract plenty of local attention. Small road-side shops will soon mushroom. In time, with more power available, they will evolve into proper shops following the Australian experience outlined earlier. We are now in a position to list the components of the 5KW power plant. Let us now consider a consolidated package for an enhanced post office that can be replicated on a mass basis. The post office now is part of a large building (made of corrugated iron mostly). This building is huge, 30m by 25m and all the solar panels are mounted on this roof. Apart from the post office, this building is also a community centre, has provision for shops and a market, etc. With cheap, robust construction, including land price let us say this building will cost Rs 30 lakhs. Solar cell per watt now costs $0.5 or Rs30. 150KW or 150,000 watts of capacity will cost Rs 45 lakhs. http://www.solarchoice.net.au/blog/solar-panel-cost-to-fall-to-36c-w-by-2017-gtm-research/ Solar panel prices could fall in price from current rates of about 50c per watt to 36c/W by 2017, according to a report ("PV Technology and Cost Outlook: 2013-2017") from GTM Research. Solar panels (or modules) are the most expensive component of a solar photovoltaic (PV) installation, and reductions in the cost of their production have significant implications for both end-users as well as the companies who manufacture them. Solar PV technology prices have fallen dramatically in the past few years, and previous predictions of future prices have turned out to be above the mark nearly across the board. In 2009-2010, $1.00 per watt was seen as a realistic medium-term goal for the industry; in 2013, leading Chinese manufacturers are already nearing $0.50/W. Note: Very recently (29 Oct 2013) I vistited KERI in South Korea as a presenter in the ICEMS2013 conference. There they have invented a new technology involving plant photosynthesis that reduces the existing solar cell price by 80%. While its efficiency is 50% of the normal solar cells, it works in cloudy weather so overall its performance is comparable but of course is much cheaper. The Rs45 lakhs for the solar panels talked earlier relate to the manufacturer's production cost; the sale price could be twice as much for now. The 150KW electrolysis plant should cost Rs 5 lakhs. The compressor and storage tank another Rs 10 lakhs. These costs are tentative ball park values and market research will provide accurate results. A 5 KW fuel cell should cost $25,000 or Rs 15 lakhs. So the raw infrastructure costs amount to Rs 105 lakhs. Taking Rs 45 lakhs as construction overheads, and an extra Rs 50 lakhs for the solar panel overheads in terms of manufacturer's profits, an amount of Rs 2.0 crore seems to be sufficient to start the 5KW pilot project. This figure, of course, is for the one-off case. Mass production of these units should see a sharp drop in cost. Along with the projected fall in component prices, these units when mass produced with as much import substitution as possible should be costing not more than Rs 120 lakhs. We now consider the gains from the installation. We have an Australian standard post office and shopping centre in the remote area that is now a focal point transmitting information and entertainment to the public. It is a place where outsiders may come for relaxation, industrial and business needs, tourism, and initiate new projects. Let us say that 1000 people will be influenced by this initiative. If their average earning potential increases by Rs20,000 per year, then that will be a gain of Rs 2 crore to the community per year. Similarly, one may expect real estate prices to go up in the region in due course. The land sales at high prices will lead to more taxes to the Govt. coffers. If the amount of Rs 2 crores was got from the banks at 10% interest, then the financial stakeholders, business managers, etc. would have to repay Rs20 lakhs of interest, along with a fair bit of the principal. With a lower interest rate, and greater repayments, the entire amount could be paid back within 10-20 years - with luck, hard work, insight and will. The success of the 5KW pilot plant will naturally lead to its expansion, to the 200 KW stage which should be enough for a small rural community. In a particular configuration, the 200KW pilot plant will be composed at most of 40 numbers of 5KW plants. The new thing here is that all these 40 (or less, depending upon the capacity of the fuel cell the minimum capacity being held at 5KW) plants will be connected by a network of pipes that join all the storage buffers. Also, there will be monitoring to see how much hydrogen one site has put into the network, and how much hydrogen it has taken out. Looked this way, the 200 KW pilot project is a scaled up version of the 5KW empowering a whole region as opposed to just a single site. Cost wise, the mass production involved will decrease the per-site cost, but the cost of joining the sites to provide constant hydrogen supply to all the sites will be added. So, roughly the 200 KW pilot plant project should cost Rs 60 crores. There are other configurations of the 200KW pilot plant that we shall discuss later. As we have seen, the surplus power of 530 units is generated on average at every 5 KW site. In the 200 KW power plant, there will be generated 40 times that amount, 21200 units per day that can be used by the regional community in various ways. Enormous quantities of oxygen and pure water will also be created, and these should become the basis for metal-working industries. The shops talked about earlier now will really take off, as they will get power also at night. Refrigeration apart, there will be need for electric ovens for making various kinds of Australian- standard bakery items: cakes, pastries, pies, rolls... The very look of the region will be altered to meet the high expectations. In later sections we will discuss the 200KW pilot plant in more detail. In this particular section, we have stressed upon the 5KW power plant simply because this is the grass-root of the futuristic Hydrogen Economy. Instead of solar power, we could also have natural gas power or gobar gas power. The hydrogen component in natural gas or gobar gas can be extricated for use in the fuel cells. Hydrogen can be created from biological processes, or from coal gas. These alternatives also could be explored as inputs to the Hydrogen Transmission Network. In windy areas, windmills could be used; similarly for hydro-dynamic, geothermal, tidal, etc. Nuclear power stations set up in the remote area could be directly converted into hydrogen and sent by the pipeline to the Hydrogen Transmission Network. The key goal of the Hydrogen Economy initiating pilot projects is to kick off the Hydrogen Economy as the most effective way to bring plenty and prosperity into the neglected rural areas. Instead of assuming that growth will trickle down from the city to the village, the reverse is now proposed - a healthy and prosperous countryside will boost the health and values of the city. There will be no need to import oil and make installations for its sale in the rural areas. Also, there will be no need to create and maintain power lines. The savings from this initiative will be truly substantial and go a long way to financing the Hydrogen Economy. Buses for transport will run on hydrogen, as a bonus. Hydrogen will be available for industrial use such as welding and metallurgy. Pure water and oxygen will be available as by products. It is true that a good deal of capital will be invested; but it is also true that this capital will bring in huge returns and be the seed of the future prosperity. The rapid build-up of assets that will profitably used on an ongoing and consistent basis, will inevitably lead to the steady and remarkable growth in the area. The capital invested, will soon be made to appear insignificant with respect to the new and additional assets that will be created from the labor of the people. Confidence, assets, worth, knowledge, generation of goods and services schemes will build up instead of being dissipated as has been the case so far. A high quality of life will be provided in the most neglected but healthy and scenic rural areas. This may in due course prompt a migration from the city to rural areas, with benefits to both sides. It has been suggested by one Shri D M Joshi (based in London) that home schooling should be legalized and that the school background should not be a must for public exams. With such a legal breakthrough, it may be possible to raise children in rural areas as now there will be more opportunities. The best test for the success of the pilot projects is to see whether or not they are duplicated or taken up with necessary modifications by third parties. If they take off like other successful technologies (mobile phones, internet, railways, post office) then what can be better! Thus assessing the psychological state of the population before and after the pilot projects is crucial. These before-and-after scenarios must be documented. Media presentation of the pilot project techniques should be accompanied by demonstrating the popularity of these projects, and the positive changes they have brought to the people and the region. Finally, I strongly urge the decision-makers to be not intimidated by the cost factors. Please consider the overall situation. I know that it is cheaper on paper to electrify the rural areas with the standard methods. But we know that these old methods have not worked so far, and there is no likelihood they ever will. Do consider that the large amounts to be invested in the hydrogen economy have a very good chance of providing sound, solid and consistent returns. A stakeholder in a project may be defined as someone who has, or who could have, a direct interest in the project. The obvious stakeholders for this project are WBREDA and other Govt. of West Bengal functionaries, committed social workers like Shri B K Banerjee and the author himself as the inventor of the patented Hydrogen Transmission Network. There are other well-wishers, such as social workers like Shri B B Chawla and Shri R N Jana, who have represented the author and put the case for the Hydrogen Economy to the concerned Minister. The media has also taken a keen interest in this project, as will be evidenced from press cuttings. A good deal of public interest, very favourable indeed, has been created from such press coverage that included material from interviews presenting the author's ideas in this matter. RMIT Melbourne has been instrumental in providing academic credibility for the Hydrogen Transmission Network concept, following the positive RMIT evaluation by the eminent professor in Chemical Engineering, Shri Satinath Bhattacharya. 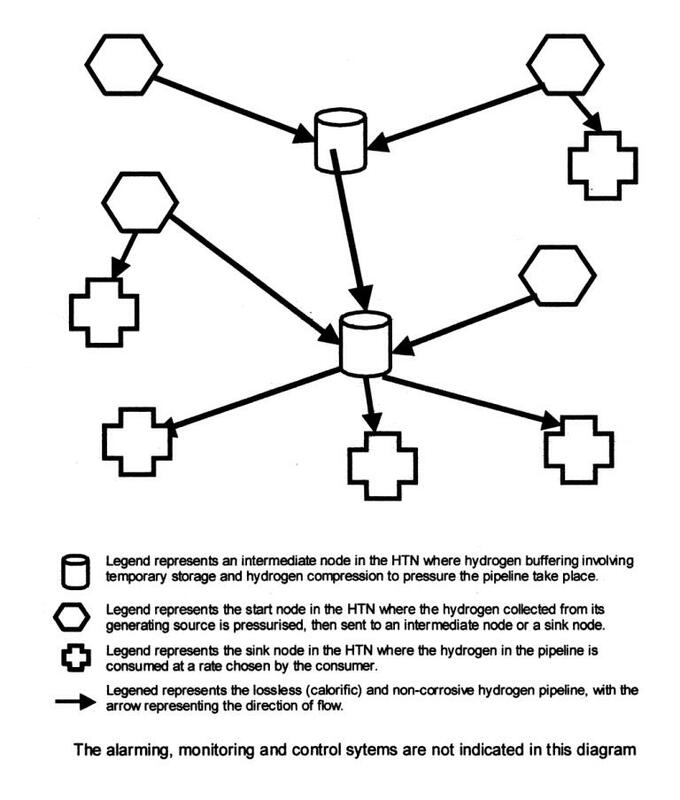 Mr Ilya Shambat (co-inventor of the HTN) has created a website showing the fundamentals and scope of the Hydrogen Transmission Network, its url being: www.htnresearch.com/index.htm. Primary stakeholder: The primary stakeholder is WBREDA as the chosen Govt of West Bengal agency which has the political authority to initiate the Hydrogen economy. WBREDA may choose to delegate its authority to some other institution, which then would become the primary stakeholder. The primary stakeholder will also be responsible for the overall auditing of the project: this role could be delegated to some responsible auditing firm. Financial stakeholder: These are the people/institutions that will be funding the project and also monitoring the development. At the moment these entities are not known. It is expected that with due media and grape-vine publicity after the publication of the document and the subsequent workshop, their details will become evident. Going by normal experience, such stakeholders should be a mixture of the following: officials representing agencies from the Government providing Govt. grants; international charity organizations; local charity organizations; religious organizations; motivated individuals both local and abroad; banks; co-operative organizations; industrial groups; real estate venture groups; venture investment companies. The financial stakeholders will be responsible for the economic success of the projects. They are likely to ask, and also get, special licenses from the Govt. relating to the expansion of the Hydrogen Economy with the proven success of the pilot projects. Primary Technical stakeholder: It will be the responsibility of the primary and financial stakeholders to appoint the primary technical stakeholder. The technical stakeholder has to be an established and reputed engineering concern based in India. There are many such concerns, both in the public and private sector, that may be interested in the technical aspects of project implementation. MECON is one obvious choice, Kirloskar is another. The author has had ties to Bharat Electronics (1978-89). He worked with Shri Anil Kumar, the current CMD of Bharat Electronics, in the LFDR (Low Flying Detection Radar) Antenna Project for a number of years; and also with Shri P C Jain (Director, Marketing, Bharat Electronics) in the development of a range of stripline and integrated IFF antennas. Perhaps these gentlemen could be interested? We assume that MECON is the chosen primary technical stakeholder, having agreed to address, detail and oversee the technical issues sketched in this document. Secondary Technical stakeholders: The primary technical stakeholder will require secondary technical stakeholders to provide the raw and finished materials, imported parts, assembly know-how, test and monitoring equipment. The components required for the Hydrogen Economy can be bought off the shelf. There are already many companies big and small that are developing the Hydrogen economy in the USA and Europe. Getting into contact with them, by doing suitable Internet searching, following grape-vine contacts, journals and new items, etc. is a preliminary step for the MECON engineer. It is necessary to get them involved as suppliers, consultants and assembly experts. It is probably wisest to get in touch with German manufacturers as they have the best experience in Hydrogen technology. The Chinese are producing increasingly cheap solar cell panels. Project Manager: MECON having got the contract to initiate the project will have to hire or appoint a Project Manager. It will be the duty of the Project Manager to directly manage the project from concept to completion. He will receive the technical blueprints from MECON, and the finances from the financial stockholder. He will interact with the local authorities, the local elites, and the suppliers and work forces. Local authorities and landowners: This project cannot be successful without the hearty co-operation of the local authorities, who would represent the best interests of the local population. The roles of the local authorities would be to educate and inform the population about the scope of the project; select and procure suitable land for building the project's asset base; select the manpower for installation and maintenance; relate to the setting up of enterprises based upon the new energy provisions; monitor and evaluate the success of the project in terms of cost-effectiveness. The local authorities include Govt. paid staff like the postmaster and other Govt. functionaries, relevant political entities, local social stalwarts, representatives of agriculturalists, pastoralists, fishermen, small industries, traders, homeowners etc. The local landowners may expect to profit from escalating real estate prices. Business Managers: The entire purpose of the Hydrogen Economy is to provide prosperity to the people, through the provision of electric power and the supply of hydrogen, pure water, oxygen etc. A number of privately funded or state-supported businesses and enterprises should come up as a result of this pilot project, when it will be clear that 7*24 power supply will be provided in the location till the end of time. Business managers will then be around to make use of the abovementioned new provisions. To the extent that they be numerous, and enthusiastic, and keep on demanding for more energy, we will realize that the project has been a success. The nearest engineering parallel to the proposed Hydrogen Economy project, from the perspective of the ambitious developing nation, may be Libya's successful "Great man-made river project," described as an engineering marvel and elaborated in http://en.wikipedia.org/wiki/Great_Man-Made_River. It may be instructive to note its administrative structure. From the above website, we learn that the project is owned by a particular Govt. approved authority, is funded by the Govt., and the work is done by contractors. The pilot projects for the Hydrogen Economy need not follow the above Libyan model, especially as the direct funding from the Govt. is not necessary for its success. The financial stakeholders will be responsible for the funding. What the Govt. agency WBREDA as the primary stakeholder needs to do, after fully realizing the great potential of the Hydrogen Economy, is to select a particular contractor (primary technical stakeholder) to initiate the Hydrogen Economy. Secondly, it is necessary to give media publicity to this project, in order to attract those willing to make the financial investments required. Once the players have been identified, the Govt. needs to make suitable concessions to the players in terms of licensing the expanded growth. Thus, by using its political authority, the Govt. can initiate the Hydrogen Economy with no funding at all (unlike the Libyan project which was funded by Govt. revenues). It will become clear that this paradigm will be possible because the Hydrogen Economy should bring enormous profits to the sponsors, who will thus get very good returns upon their investments. If the Govt. does decide to invest public money from taxation, it will be with the commercial spirit of getting swift returns like any other private or corporate investor - as opposed to the Govt. dispersing grants into thin air. With the selection of the primary technical stakeholder and the financial stakeholders, the role of the Government institution WBREDA is to give the go-ahead and start the project, and then monitor the progress, look at the audited accounts of expenses, gauge the political sentiments about the projects, see whether the revenues from the area are increasing or not in terms of increased commerce and jobs created, etc. WBREDA has already identified the area where the 5KW pilot project is to be installed. This is a crucial decision, for it is most important that the local population be united and enthusiastic about the implementation of new technical ideas for a resulting superior social and economic situation. The primary technical stakeholder will have the responsibility of making the pilot projects a reality. For this purpose, he needs to appoint internal staff or external consultant to internalize thoroughly the philosophy and technical scope of the projects as evident from this document and other related documents such as the patent for the HTN, and other early proposals made relating to the HTN implementation in such states as Jharkhand and Gujarat. Since the components (to be detailed in a later section) are off-the-shelf, it is necessary to purchase them, bring them to the site, and assemble them on suitable civil engineering structures with appropriate mechanical engineering considerations to protect against environmental factors and accidents on the one hand, and increased efficiency on the other. I would strongly advise that in this initial phase it is most necessary to get a skilled hand to manage the nitty-gritty technical matters. Therefore, it is most important to be in touch with suitable foreign partners who have already mastered the necessary technology. It is not recommended to relearn the wheel! Nor is it necessary to insist upon technology transfer. All that is required is to find a suitable foreign partner who will solve the technical issues relating to this technology which while new in the West Bengal context is old news in countries like Germany. Again, suitable agreements relating to licensing and supply may be made with such a partner. Thus, it could be made clear that if the project worked there would be a monopoly provision for the supplier. This sort of understanding could help to reduce the initial project cost, as the foreign partner could make concessions with expectation of future orders. Later on, with mutual understanding based upon sound business principles, standard Indian techniques like import substitution and alternative sourcing could be employed to reduce the hardware and installation costs. The most important matter is to make the pilot projects an existential reality, as quickly and efficiently as possible; on the most transparent and democratic basis and following sound accounting practices. A consulting company like MECON should find no difficulty in finding a suitable foreign partner with adequate technical know-how for this venture. With the secondary technical stakeholders identified, the next step is to make the suitable blueprints based upon the technical outline presented in this and related documents created by the author on behalf of his company, HTN Research Pty Ltd. The technical outline for the 5KW and 200KW pilot plants will be described in later sections, along with relevant technical details. During or briefly after the design finalization, a suitable person with adequate project management knowledge and experience needs to be hired to directly supervise the installation and running of the pilot projects. His functions will be wide-ranging. He would have to interact with the local authorities and the interested business personalities, the primary and secondary technical stakeholders, the workforce involved in the construction, arrange for the transport and installation of the required materials following the blueprints, and finally the running and maintenance of the whole project. The success of the pilot project will directly depend upon his energy, skills and tenacity. The success of the technical activity, for the project manager who of course is honest, intelligent and hard-working, let us take for granted. Engineering and management advances ensure quality and reliability of the installation. What is far more challenging is to make the best use of the electric power generated by initiating enterprises that are viable and satisfying. To that end, it is of the greatest importance that the project manager interacts satisfactorily with all those identified as Local Authorities and Business Stakeholders. A good deal of tact, understanding of the local situation, experience, knowledge, insight etc. is necessary to make progress on a fair, equitable and democratic basis. We will deal with how the Business stakeholders could make use of their new empowerment in a later section. For now, let us agree that when the Business stakeholders are satisfied, and show their satisfaction by demanding more hydrogen or more power to run their business in order to make more profit, then our Hydrogen Economy is a proven success. Their satisfaction is the litmus test! Now, how to keep the entire machinery running smoothly? Let us stress that the Hydrogen economy, which guarantees power availability, is very different from the normal grid transmission. Under the present regime, where electric power is delivered by the grid, nothing more apparently needs to be done by the establishment after the installation; there is no stress upon developing businesses that will use the power available. Unfortunately, this supply of power is very often erratic; transformers burst; the lines get upset; power gets stolen and sometimes the conductors as well. This unreliability affects the rural economy in many ways - expensive alternative sources of power (diesel) have to be used; there is no way to generate steady industry and business; people clamor for lower costs; collecting bills is a hassle; repairs take time and money. Thus a huge amount of Govt. time and money is required to maintain the grid. The beauty about the Hydrogen Economy so far as Govt. involvement in maintenance is concerned is that the Govt. does not have to spend time and money and hassle in providing its maintenance. The Govt. can completely save the money it now spends the ways described in the above paragraph. To show how this can happen, we have to digress slightly from the topic, to the keynote address of Prof. Hori (University of Tokyo) at the International Conference on Electrical Machines and Systems (2013) held in Busan, Korea. Prof. Hori's main point was about the way cars and buses would run in the next century. They would be powered by electricity, but not with wasteful, expensive and polluting batteries. Instead, advanced capacitors that are much more rugged and cheap, and not using minerals, would be used. At any bus stop, the capacitors would get charged by wireless transmission from a loop antenna that would transfer electrical energy via microwave to a similar loop antenna in the bus. This would work just fine for fixed routes. For cars, charging would be done on the move by antennas placed by the roadside, and in walls and embankments. The obvious question arises: how is the energy involved to be accounted and paid for? It seems impossible! The simple and brilliant answer provided by Prof. Hori is that the energy so provided would be free, in the economic sense that public urinals in marketing complexes, airports, etc. are free. My understanding is: Those using the energy would be providing service to the economy and the cost of providing the energy would be taken from the resulting gains to the economy. The shopkeepers in the marketing complex together pay for public urinals, on the understanding that the major users are its own customers. From the community's perspective, the energy cost would be just another reasonable publicly funded cost as street lighting, fire-fighting, police, jails and in fact the very Government! The basic assumption is that whoever uses the "freeБ─² energy, is contributing to the good of the public in some way. Once the infrastructure for energy transmission will be in place, and energy required provided by whatever sources, we will have "freeБ─² transport for all time! Major users could be made to pay more for their usage by suitable licensing fees related to vehicle registration, mileage covered, etc. It may now be possible to see how Prof. Hori's idea may be adapted to the Hydrogen Economy. We take it for granted that the Hydrogen Economy will be a huge commercial success - the local businesses and enterprises, educational institutions and services and commerce, will take off wonderfully and provide sound and lasting returns upon the investments made by the stakeholders; mainly the local business managers with the support of new rich people coming into the area. So, it will be in the interest of those local satisfied and profit-making parties to maintain the entire system as well as they can, on their very own and without needing the Government. Tapping and stealing energy and copper respectively will become non-issues. The ruggedness of the steel pipes; the non-existence of transformers; and the avoidance of shaky transmission lines will make the task of maintenance a lot easier than is the case today. To initiate the Hydrogen Economy, all that the Govt. do is to pass its approval, suitably modify the laws declaring Hydrogen a dangerous gas, and select a primary technical stakeholder like MECON to make the pilot projects (to be sketched out in more detail later) a reality. I believe that these projects, when executed as per the guidelines presented in this document, will be a great success in every way. Their social and economic benefits, when broadcast both by word of mouth and the media, will no doubt ensure lasting success and happy progress to the vast and marginalized rural sectors as desire for change and demand for more power will inevitably grow. Rapid expansion of available hydrogen gas and electrical energy facilities, from prolific duplication of these pilot projects, will satisfy their needs. By inverting the pattern of technological and socio-economic development this way, through worthy investments in the remote rural areas, this novel and popular approach would have a very good chance of complete and outstanding success within a relatively short time period. The most satisfying and beneficial outcome in the long run would be the reversal of the past and current population flow from the rural to urban areas. Below (section 5.1.2) is the schematic for the basic unit 5KW plant. It comes as a single integrated unit, of very rugged yet cheap corrugated iron construction (which is the basic material for most rural constructions in Australia). Because of this construction, it will be easy to mount the solar panels rigidly for the building will be designed to make that possible. They will need minimal maintenance (I do not even clean the solar panels on my roof - the rain does that!). Thus, the building has its own inbuilt 7*24 power plant - even in bad weather, there will be enough hydrogen built up throughout the day to power the appliances like the refrigerator at night. Because of the large size of the building, apart from the post office other businesses could set up shop. There would be a communal space for entertainment and meetings. Around the place there would inevitably be a market, some religious institutions, school, dispensary, hotels or guest houses, etc. Aesthetic approaches are most necessary for high spirits and to attract tourists and visitors, so the place could be surrounded by a garden and nice pathways reflecting the local mood and flora. Tourists and visitors would find the scope of recharging the batteries of their equipment to be attractive, especially as this plant is expected to be constructed in the middle of nowhere. The diagram below is self-explanatory. What is important is the availability of water nearby - seawater or brackish water are fine. This unit can be hooked up to other units, to receive or send hydrogen through the interface which will also do the monitoring/alarming and the metering. One may wonder, why go to all the trouble and expense just to get 5KW of power. One answer is to go to Holland and see how they made huge windmills with whatever resources they could have, a few centuries ago. The whole purpose of making the windmill was to provide power; it was making the best use of their top free natural resource: wind! The whole point of the windmill was to grind flour, spices, etc. very fine, better than any other way. So, a lot of raw material came to the windmill sites, which produced finished goods and took their percentage. And Holland became very rich as a consequence. The limitation of the largely self-sufficient 5KW pilot plant is obvious. While it will be more robust on the 7*24 basis than the current systems (electric grid and solar-battery) there will still be quite a few days in the year, when thanks to bad weather (clouds, rains) solar power will not be available in the daytime - just enough to run our postoffice at night! The business managers will not be happy with this situation. They will want their daytime supply of electricity, the amount they get with good weather. The only really sound way out, apart from extending the electric grid to the remote area, is to provide the Hydrogen Transmission Network (HTN), a new system of pipes, buffers, compressors, monitoring and metering, to provide a constant source and sink of energy everywhere, and all the time. Without the HTN the Hydrogen Economy will not be able to take off. The 5KW pilot plant has to be connected by a pipe that has the ability to carry Hydrogen gas without corrosion, to some other supply of Hydrogen. An analogy is to connect two gas (LPG) cylinders by a long pipe. The stores of Hydrogen at any site we call buffers; the pipes can carry hydrogen along either direction depending upon the pressure potential. There will be low pressure at the receiving source, and higher pressure at the sending source. Oxygen too could be piped using the same pipeline to some other destination. Similarly, natural gas could also be piped using this pipeline. Once the pipelines are all laid down, the choices for energy transmission go up, and the most suitable option will be naturally chosen. The 200KW pilot plant configuration has to be more versatile than the 5KW pilot plant configuration, which is designed for mass production. Just as the 5KW pilot plant is the mainstay of a small group of people, the 200KW pilot plant is the mainstay of an extended community. Nothing very much can be proved by the success of the 5KW pilot plant project. After all, in remote areas in North America and Australia 5KW systems are sold regularly on a commercial basis - energizing the house is part of its construction. Solar cells to battery is still the most cheap and popular option; but more expensive systems take in natural gas, extract the hydrogen component from it, and use a fuel-cell inverter system. These are the kind of people who would be most happy to use Hydrogen as fuel, if available. We will now see that the 200KW pilot plant project offers enormous scope to many existing established professional sectors of the community: builders, workers, agriculturists, engineers, businessmen, industrialists, metal workers, teachers, doctors, sports and entertainment related personalities, military and Govt., computer and telephone people, etc. In other words, the 200KW pilot plant, using the Hydrogen Transmission Network, will be the key and visible basis for the Hydrogen Economy. There could be five broad categories for the 200KW pilot plant configuration. They will be discussed in the following sub-sections. As described earlier in 5.1.1, the success of the businesses and enterprises will inevitably lead to the need for more power. This will only follow the pattern set up by other successful technologies; internet, mobiles, phones, banks, radio, TV, etc. The most obvious solution is to buy another 5KW package. Now, it is unlikely that this new unit will be near the earlier one; it could be a few hundred meters distant. It will be soon seen, that as a result of varying usage, sometimes there will be more hydrogen in one tank, and less in the other - and the demand for hydrogen will come when there is none left in either tank. In which case, it is wise to connect the two tanks together, so that the demand is more readily satisfied. This averaging technique is ubiquitous in all networked systems. When the two tanks are suitably joined by a pipe, with proper metering and monitoring arrangements, we have initiated the Hydrogen Transmission Network. Obviously, the situation will not stop with just two units. The numbers will keep on expanding with increasing demand. The spatial distances will keep on increasing, and the pipes joining them will now form a true network. Each site will know how much it has given to the network, and how much it has taken. The balance has to be recovered or paid as per the mutually agreed pricing. Let us say that when around 40 5KW sites are thus connected, we have a 200KW pilot plant that has grown up on the popular needs basis. In this case we may think of building quality hand tools right in the rural areas. Gum boots, wheelbarrows, rakes, picks, crowbars, trowels, etc. can be made and used locally to increase the efficiency and ease of agricultural production. Efficiency can also be greatly increased with use of power hand tools like modern drill guns with Lithium-Ion batteries. Once these batteries are fully charged, quite a lot of work can be done in the absence of mains power. With availability of electricity in the rural areas, these efficiency-increasing tools can be adopted. I must note here that all possible efficiency enhancing tools (efficient hand tools, and all possible electric tools) are used in Australia. The idea always is to finish the job as quickly and as correctly as possible. There is no gain in prolonging any job! Doing any job quickly offers the opportunity of doing more jobs for more gain, or more time to pursue hobbies and relaxation. Here the set-up may be to have 40 5KW units that are co-located, or located within a small distance. We note that we will in the daytime have on the average 530 * 40 units of available power, not counting the units that will be required to provide the hydrogen to run the 5KW * 40 fuel cells for power at night. Now, 21200 units is a very significant amount of energy to be used up in a day. Also 200 * 16 = 3200 units should be enough power to tide over the night-time situation. 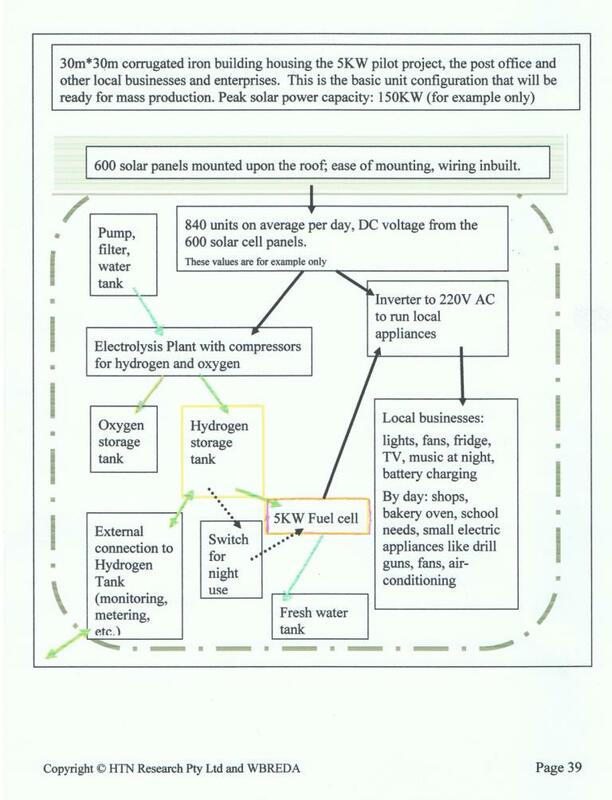 However, as for any 5KW plant, there will always be more need for hydrogen at some times, and less need at other times. That is, all 200 KW plants need to be connected to each other using the Hydrogen Transmission Network for a continuous, flawless, 7*24 electric supply situation. Then again, some industries may need more power than others. This surplus could be made up with fossil fuel. So, LPG gas can be piped to some destination using the HTN. So the 200KW pilot plant could be the seed for future industries, that when started will use up all sorts of power but mainly deriving from hydrogen. Shopping. entertainment and health concerns are the key money-making methods in any modern materialistic society. Getting the returns for investment made in a sound and certain manner involves constructing shops; organizing people to meet at stadia for cultural and sports meets; and increasingly gymnasiums or fitness centers are getting popular for health reasons. There is no reason to believe that what works in urban areas cannot work in rural areas, especially when people there start to obtain increased spending power. The 200KW pilot plant could be constructed in a manner to cover a large stadium, thus making it an indoor stadium where sports like basketball, volleyball, badminton could be played. In the very large scenario, tennis courts could be completely covered; in a few cases even cricket courts could be completely covered. Needless to add, the whole covering surface or roof would be packed with solar cell panels. On the average, as stated in 5.2.1 we would have a surplus power of 21200 units per day. Usually the construction of a stadium does not include shops or gymnasium facilities, because of historical reasons. However, there is no reason why all these facilities should not be integrated together in a single large unit. The 200KW pilot plant in this case need not be made of 40 5KW fuel cells, but any number which is the cost-effective. Like, there could be 2 nos of 100KW fuel cells, if that made more economic sense. It is not expected that this stadium situation will absorb all the power it generates, so this could be a source of power to other 200KW plants. Thus, a 200KW stadium and a 200KW industrial complex could balance each other admirably, and contribute to the economic growth and human satisfaction levels in the rural areas. With its pledge of duty towards its citizens, the Govt. has to perform and supervise many functions. It would be most convenient for the success of the Hydrogen Economy if any Government institution such as the military, research labs, police, customs, schools, etc. were to adopt the 200KW plant complex as the model for its energy needs. Most importantly, the seal of approval from the Govt. is essential to spur the development of the Hydrogen Economy. A 5KW plant may be used to power up quite a few families (say up to 20 people) for the night. In the daytime, the power usage will not be very high. Thus, the 200KW residential complex scenario (where 40 units of 5KW are now housing people) is a generator of energy, and this energy that is sold will be beneficial to the residents. In this case, the buildings will not be as functional as the 5KW structure. They will however have the same capacity to generate electricity - that is, there should be 150KW of solar panel power per 5KW fuel cell capacity. The buildings will be constructed in such a way that the installation of the solar panels will be integral to the structure, as also the electric circuitry. Those people who buy such residential areas will never have to pay for energy; rather, they will make money by selling their power in the form of hydrogen. Of course, for this to happen this particular configuration of 200KW plant has to be connected to the HTN. The builders/promoters/real estate agents are the sorts who can be expected to be eager about this scenario. They should have a market from those in urban areas who desire a rural retreat, or for investment purposes. The HTN and the associated new technologies and services will require manpower from urban areas. They have to be accommodated, and so the need for residential complexes. The drift of population from the moneyed urban sector to the rural sector will be most welcome. In due course, the poorer members of the rural population will become rich enough to buy into these complexes. Hydrogen has been systematically debunked as a means of transport by the established powers in the oil and transport industry. However with a lot of hydrogen becoming available, the re-use of airships filled with hydrogen becomes irresistible. Modern manufacturing and safety techniques, along with more reliable weather forecasts, should make for airships become a viable, cheap and rapid means of transport in rural areas. The scope for tourism is very great - this will accelerate the population drift from the urban to the rural areas. Hydrogen burnt with nitrogen creates ammonia, and ammonium salts (nitrates, phosphates) can be easily made by reacting ammonia with the relevant acids. It may be instructive to known that the surplus power from the Bhakra Hydro project was used to electrolyze water to form hydrogen, and that hydrogen would be used to create ammonium salts for fertiliser. Buses and trucks can use hydrogen for fuel, with the fuel-cell electric motor combination as opposed to burning diesel oil. Successful trials for such buses have already been done in Australia. An engineer from General Motors (USA) who is also a family friend has assured me that GM has all the technology for hydrogen-powered vehicles. The unavailability of hydrogen, resulting from the animosity of oil companies, has hindered the growth of hydrogen-powered vehicles. However, with the HTN there will be always be hydrogen available to power land vehicles. A huge market will open up, with proven technology. With both pure hydrogen and oxygen at hand everywhere, anything in metallurgy can be done in the most remote rural areas where input costs will be cheap or at least competitive. The hydrogen-oxygen combination produce the highest know temperatures - anything can be melted. Thus, many small-scale welding or ore-extracting situations may be created throughout the countryside. Complex parts can be manufactured. Rare earth minerals, so useful to make powerful magnets, may be extracted from the ore with comparative ease. While hydrogen because of its corrosive nature cannot be piped in a normal gas pipe, other gases that can be piped (natural gas, LPG, oxygen, ammonia) may be piped using the HTN, with suitable switching between the pumping situations. Thus hydrogen need not be the only fuel around; once the pipeline is laid, for augmenting the supply of fuel LPG can be piped from source to destination. This is a high level document, for the decision-makers. It is expected that if approval is made, it will be handed down to engineers and technicians for implementation. The overall philosophy and guidance has already been given in terms of the terminologies, architecture, inputs and outputs and components. The details have to be worked out for the most cost-effective and timely implementation. This is a time-consuming and difficult task, and will require the full attention of quite a number of concerned and qualified people who are specialists in the relevant technologies. The easiest and most effective method would be to simply give this document to the secondary technology stakeholder, and ask him to make the blueprints. The relevant components that are required for installation have already been specified in the schematic diagram for the 5KW plant in . Appendix 2 provides further details. Information in this field is subject to rapid change. The latest Internet searches should provide better and more relevant facts, so the opinion of the specialist in this field is very important. The price of hydrogen is held to be a limiting factor in the Hydrogen Economy. It is argued that as the price is too high, it can never replace oil for transportation purposes, let alone for providing energy as a replacement for coal or oil. In the case of the hydrogen-derived electricity based upon the HTN, this situation is simply invalid. While it is true that hydrogen will be bought and sold via suitable metering at the end points, the fact is that hydrogen as used for electricity is merely being the carrier of energy when being used for electricity generation and consumption. It is energy (whatever - from solar, wind, hydro, fossil fuel, etc.) that will be bought and sold, not hydrogen as such. It is energy that will be efficiently transferred from the various sources to the many sinks, using the HTN. Looked at this way, the actual cost of hydrogen which in this case is acting as a medium to transport chemical energy (just like transmission lines carry electric energy) will be irrelevant. Looking at the situation in more detail, for the larger case involving the Hydrogen economy which will encompass transport, metal working, fertilizer, chemicals, etc., we find that 50 units of electricity must be used to generate 1 Kg of Hydrogen. This is an inescapable fact, and thus a key foundation for our analysis. If we take Rs4 per unit of electricity, that gives Rs200 as cost of 1Kg of hydrogen. Since hydrogen fuel cell-DC motor cars are having much higher efficiency of fuel to motion conversion than petrol cars, hydrogen cars are competitive today. They have greater range, speed, acceleration, durability than normal electric battery cars. The kind of hydrogen we are looking at, is derived from water as that will be 100% carbon free and thus renewable. Fossil fuels will become ever more scarce and expensive, difficult to get at, and will involve foreign dependency issues. Sun's energy and seawater are the two main inputs, and both are free and forever. So the cost of futuristic hydrogen at source will be entirely based upon the input equipment and construction costs, depreciation and ongoing maintenance costs. The cost of power from hydrogen at the destination (home, industry) will also depend upon the transmission method (piping, store and carry) and the way the hydrogen is converted into electricity (fuel cell, or proposed hydrogen-steam turbine). Currently Hydrogen is around $4.00 per Kg as it is made from coal/oil/gas. This suits oil companies, and for them hydrogen economy can only be futuristic. Lower the cost of hydrogen, greater the scope of the hydrogen economy. Part of the reason for the high price of hydrogen is the problems relating to the current methods of hydrogen storage and transmission. With the HTN, these problems will be naturally overcome as the hydrogen will be used up almost as soon as it is produced. We will explore this issue in terms of solar power to electric power costing. Rubbery Facts: 1 sq meter of solar cell area costs $75 (and decreasing) and produces 120 Watts of power for at least 25 years. This is a conservative estimate. In reality the picture is even rosier, and will get even better with time with more advanced technologies in terms of cost-effectiveness in manufacturing and solar-electric efficiencies. In engineering we take pessimistic estimates to be on the safe side, so it is desirable to plan with conservative figures. $75=Rs4500 investment thus produces 0.12*25*365*5 (assuming 5 hours of sunlight out of 24 on the average) 5475 units or Rs21900 at Rs 4 per unit over 25 years at constant prices. $75 worth of solar cell thus creates 5475 units of electricity or 110 Kg of hydrogen over 25 years. Thus, roughly, the realistic cost of hydrogen at source is $75/110 per kg, or $0.68 or Rs41 per Kg averaged over 25 years, not taking other construction and human and maintenance costs which will increase the price to a higher value. When the cost and life of the solar cell decreases and increases respectively, this value will become less. Also, we note that this price is independent of inflation! While fossil fuel costs will keep on increasing, the hydrogen price from solar will keep constant! This is a very significant and most vital advantage for Hydrogen over fossil fuel/electrical HV transmission. But we must stress that this advantage will only happen when we have the HTN as that will eliminate the storage and transmission overheads that makes the price of hydrogen so high. With hydrogen prices at $4 per Kg if you electrolyze water with power from the grid, this mathematical analysis shows the clear superiority and need for the Hydrogen Transmission Network. I must stress yet again that the Hydrogen Economy can never take off without the HTN. The overall macroeconomic effects of the pilot projects when mass produced by the million to serve the energy needs of the nation, will be discussed in later sub-sections. The statistical values used in the table below have been obtained from the Encyclopedia Britannica 2012 Year Book. They clearly show that irrespective of the size, population, race, culture, economic strength, political situation etc. of the sample nations (which have vast diversities) there is a definite correspondence among the values obtained by dividing the per capita Gross National Product (GNP) with the per capita electrical power consumption. The range for the ratio of per capita GNP and per capita power consumption varies from 0.89 to 5.92; when purchasing power parity values are taken into consideration the range narrows, from 2.6 to 6.64. For the case of India and Australia, the averages of these two are 3.92 and 3.98 respectively. Whereas, the ratios of per capita GNP for these two countries are 33 and 11 for the dollar value and ppi respectively, or averaging 22 - a great disparity! All these clearly show the direct relationship between the GNP of the nation and the total power consumption of the nation. It is evident that the GNP is directly proportional to the power consumption, regardless of all other issues. Of course, one could make a similar argument using such measures as steel production, sulfuric acid production, etc. My stand is that electricity is a unique measure - as it is universally applicable for every nation, unlike steel. A nation can manage with zero steel production by managing with imports, but it is not possible to see how any meaningful per capita income in a modern economy may take place without electricity. So, what needs doing is to increase the power consumption, in order to increase the GNP. There is no sense in blaming any other issue - all that is needed for a strong economy is increased power consumption. Lack of sufficient power creates a weak economy by diminishing the range of opportunities. Many unnecessary twists and turns to human character take place as a result, resulting in wasteful and pointless self-deprecation. We will use the table in the above sub-section as a guide to estimate the worth of the Hydrogen Economy, where the use of hydrogen as a fuel for electricity and motion will replace fossil fuels. Let us take Singapore as a model. The ratio of per capita GNP to per capita power consumption is on the average 5.81 - which is a high value and shows that the people of Singapore are using electrical energy the most efficiently to get a high standard of living. Now the per capita energy consumption of Singapore is 8230 units, while that of India is 625 units. This means, that to get Singapore's standard of living with the same efficiency of electricity utilisation, India needs to increase the per capita electric energy consumption by 7605 units per year, or about 21 units per day. We have shown how the 5KW pilot plant actually involves the creation of a maximum power capacity of 150KW using solar panels generate 840 units daily on the average. Thus, one 5KW plant, is sufficient for 40 people. With a population of 1,200,000,000 this means that we have a targeted market for 30 million 5KW fuel cell plants. This is a very great number, and most ideal for massive mass production for cost reduction and ease of maintenance. We have earlier costed the pilot plant at Rs2 crores and a mass produced unit at Rs1.2 crores. For the sake of convenience, let us hold that Rs 2 crore is the cost per unit, and that also includes the cost of connecting the whole lot of them with the Hydrogen Transmission Network using the necessary items such as suitable piping of hydrogen, buffering involving storage, monitoring, compressing equipment. In which case, the cost of the whole project to transform India most rapidly from its present state to a state (like one huge Singapore) which would surpass every other nation by far in terms of economic strength is 30,000,000 times Rs 2 crore or Rs 6 crore crores (Rs 600,000,000,000,000, or USD 10 trillion). The resulting increased Indian GNP, following the efficiency shown by Singapore, will be USD 58 trillion. The above project cost figure of USD 10 trillion is extraordinary, but then India and Indians are extraordinary; as the quality of this report done by a person of Indian origin indubitably shows! Independence allows Indians the freedom to explore their potential to the maximum. The united efforts of 1.21 billion free, self-reliant and independent Indians, will create wealth far surpassing the USD 10 trillion figure estimated for the creation for the foundation of the Hydrogen economy. With freedom and choice, the nationalistic banks and helpful foreign financial institutions will generate the paper and electronic moneys required when there will be found a healthy and correct relation between the productive work (expressed in useful structures and services) done to match those generated moneys and the proper accounting for same. In this case as well, the experiences of new and powerful nations like Australia and USA, which were worth nothing only a few generations ago, are most useful. Money, similarly thus as in Australia and USA, has to be created from apparently nothing to match the hard-working, clever and united efforts of the Indian population for which there must be proper accounting. We must not forget that no longer the static quantity of gold or other metals form the basis for money - all the generated goods and services have a monetary significance that are exchanged for money; so more the generated goods and services, more the paper or electronic money to be created. The Hydrogen Economy will allow the positive build up and expression of all the good work done, as opposed to the present start-stop situation. That India, with its huge, hard-working, moral, young, compassionate, intelligent and God-fearing population, is still not an economically developed nation after decades of independence and lack of much warfare, is in my opinion a miracle. However, with the latest technology and new methods India could become by far the richest nation in terms of GNP within a matter of a few years. Truly exponential economic growth, on a scale the world has never known before, can be achieved by replacing fossil fuels with hydrogen. This can only happen with the most prolific use of the new patented technology, the Hydrogen Transmission Network. This report proposes that India's failure so far is due to the lack of availability of proper electrical and related power to the bulk of the population. The Hydrogen Economy which has to be based upon the new technology, the Hydrogen Transmission Network, will solve this problem. Therefore, pilot plants to initiate the Hydrogen Economy are required; it is expected that they will be as successful as the recent mobile telephony has been in India. Hydrogen as a carrier and generator of energy and facilitator of transportation will then take off with great enthusiasm following irresistible popular approval and resulting insatiable demand. The resulting new businesses and organizations will spur economic transactions and personal/group development; the more of which being made for constructive purposes, the more rapidly the nation will be pulled out of poverty and into a happier mode of living. One may ask, why not have a cheaper system of piping LPG or natural gas instead? The answer is that instead of making natural gas or oil or coil the primary fuel, we should use renewable sources of energy for a sounder environmental future. The HTN could be used to pipe natural gas or LPG - but not the other way around! Besides, natural gas or LPG is a diminishing resource, but the renewable sources like wind or solar will never diminish. The steady growth of the proposed HTN will allow the graceful obsolescence of the earlier fossil-fuel based technologies, such that the investments made there can be recovered. In the Hydrogen economy, the fossil-fuel energy will be secondary and supplementary - as opposed to its present primary status. The Hydrogen economy has the potential of making India a truly economically developed nation with a strong base in the latest modern technologies without making any compromise about moral soundness. The standard of living, the quality of life, the degree of confidence and good cheer, and the general level of happiness or satisfaction will increase exponentially; for the Hydrogen economy, being green and based upon the unlimited and everlasting power of the sun and other non-polluting renewable sources, will conform to the deepest Indian sensibilities relating to regard for Nature. Title: Load Balancing System involving the Collection, Storage and Distribution of Energy using the Proposed Hydrogen Transmission Network as an Alternative to High Voltage Transmission. A proposed hydrogen transmission network comprising of compressors for compressing the hydrogen gas; hydrogen storage systems for buffering purposes; special non-corrosive gas pipe lines for carrying the compressing hydrogen gas over short or long distances without loss of mass; and a pressure-gauging alarming system to notify of leaks or malfunctions. 2.A pumping system that will pump the seawater or brackish water, for the electrolysis purpose, and then return the more concentrated salt water back to the sea or ocean thus preventing saline wastes on land. 3.A system for switching the hydrogen pipe lines to carry coal gas or natural gas. 4.Any extraction system to obtain pure water from the conversion of hydrogen into mechanical or electric energy, this hydrogen being obtained from the proposed hydrogen transmission network. 5.A new system for the physical delivery of telecommunication services, such as through fibre optics, and coaxial cable. Complete Specification for the Invention entitled: Load Balancing System involving the Collection, Storage and Distribution of Energy using the Proposed Hydrogen Transmission Network as an Alternative to High Voltage Transmission. The present invention relates to a set of new and efficient schemes in energy collection, concentration and distribution involving hydrogen as the medium, as opposed to high voltage transmission of electricity. Pure oxygen, pure water, and hydrogen as fuel source are the additional by-products of this scheme. Mr Arindam Banerjee, in Dec. 2006, Kolkata, first conceived The Hydrogen Transmission Network (HTN) concept. His wife in Melbourne called him, when she was being threatened by huge bushfires approaching the family home. Instantly it occurred to Arindam, that the only way to stop the blaze was to starve it of oxygen, and that could be done only by a bigger fire. If hydrogen canisters were dropped upon the advancing fire-line, the huge extra energy from the combustion of hydrogen would be directed upwards, and the fire at the ground level stopped by the unavailability of oxygen. Later on, Arindam thought more on this, relating to the practicality of this scheme. The important part was the availability of hydrogen at the place and on time - only a network that would pipe hydrogen everywhere could ensure this. Arindam studied the subject of piping hydrogen, and discovered that 50 Km long hydrogen pipelines had been in existence and functioning in Germany, for a few decades. From the information he managed to research on hydrogen in the Internet, and from the energy and water consumption as shown in detail in his electricity, gas and water bills, he found that a viable solution could be had for the world's pressing energy and water problems, on the soundest-possible environmental basis. This solution is the proposed HTN, a revolutionary transport mechanism for energy. It is proposed as an alternative and much superior approach, in comparison to the existing overhead High Voltage Power Transmission. This is the claim #1. Claim #2 is crucial in the prevention of accrual of saline wastes, a common issue in existing desalination plants. Claim #3 relates to the expansion in scope of the Hydrogen Transmission Network. Claim #4 relates to the extraction of a by-product (pure water) from any method to convert the hydrogen into mechanical or electrical energy. Mr Ilya Shambat has been keenly involved in the formative stages of this invention, after it was given publicity in international electronic bulletin boards. He was the first to recognise its potential, and has been instrumental in the refinement and development of the invention, as well as its publicity in print media and in a special website. (http://www.htnresearch.com/home.htm). The key components of this system - non-renewable or renewable energy sources such as solar cell panels, fuel cells, the methods of electrolysis, hydrogen compressors and special non-corrosive pipes, alarming and monitoring systems, pumps and hydrogen storage containers, condensers - have existed for decades. This invention brings them all together, in a new energy transport system that will be bottom-up, needs based, and have organic growth as say in telephony or Internet. The advantages of the HTN, as an alternative to the HV transmission are: much lower cost of construction, simplicity of design, much less space required in all dimensions, ease of maintenance, pilfer proof design, very robust, admitting easy duplication and alternate routes, no loss of fuel energy in transmission, far more aesthetic and healthy than high voltage lines. Hydrogen being very light can go twice as much distance as natural gas for the same pressure differential; carrying it to higher altitudes will only benefit such transmission. Coal-gas can be transmitted by the HTN (not the other way around, hydrogen cannot be transmitted in a coal-gas pipe). It is the technology for the future, with the gradual and graceful phasing out of the existing power transmission system. Perhaps most importantly, the HTN is expected to have an organic growth, like the Internet of our time. That is, it is expected to have local development to begin with, very profitably from the initial stages - and then there would be linkages of the local HTNs with medium or high capacity lines. Ultimately we will have a very robust, reliable network, which would consistently give power and pure water also, and managed just as well as modern telecommunications networks. It will act as a large desalination plant, without the accrual of saline wastes upon land. The potential scope of this invention is vast, as it is expected to touch the lives of every human being on the planet in due course. For this reason, Governments and leading institutions have already been contacted. While the Governments of various nations (Israel, India, Australia, US, Saudi Arabia) have shown interest, they have indicated that the onus is upon the private sector to make this invention into a working reality. For enhanced credibility, patenting is required, as it will lead to the sourcing of finances to construct a pilot project. The Hydrogen Transmission Network is defined as a network that will deliver power by means of hydrogen flowing through pipes. 4.A monitoring and alarming system to check the flow of hydrogen, based upon the pressure levels being continuously monitored. It also monitors the level of the hydrogen in the buffers. All the items mentioned above are available, off the shelf. The claim thus relates to their integration to form a new sort of network, for energy transport as a smaller and more cost-effective alternative to high voltage electrical power transmission. Hydrogen availability as fuel or for conversion to electrical power; pure hot water, pure oxygen - are the results of this invention. Figure 1 gives a graphical description of the claim #1. The electrolysis process for breaking up a water molecule into hydrogen and oxygen, by passing a direct current in a saline solution, is expected to be the key method to convert the electrical energy into hydrogen. Thus, electrolysis plants, situated near the sea or where water is brackish, are vital as the major sources of the hydrogen to be carried in the HTN. The issue now is how the water from the sea is to be used, without accrual of saline wastes upon the land. The invention here relates to pumping the water from the sea into a container. Only a portion of that amount is converted into hydrogen and oxygen through electrolysis. There is monitoring of the salinity levels. When a certain level of salinity is reached, the container is flushed and fresh seawater is put into the container. The resulting more saline-concentrated seawater back to the sea, and this process is made cyclic. In this way, there will be no saline wastes upon land. Figure 2 gives a graphical description of the claim #2, which amounts to a desalination system without accrual of saline wastes upon land. While hydrogen cannot be transported in normal gas pipes, coal gas or natural gas can be transported in the special hydrogen-carrying pipes involved in the HTN. This could be useful by itself, for rapid fossil-fuel energy transfer. Or, when the fossil-fuel energy is thus transported to a hydrogen-making plant, it could be converted to hydrogen there. The same pipe may also transport oxygen that is generated via electrolysis. Thus, the pipe may operate in two different modes (hydrogen carrying or non-hydrogen carrying). The same pipe may also transport oxygen that is generated via electrolysis. The claim here relates to the switching mechanism to change between the two modes. A suitable switching mechanism is necessary at either end of the pipe. The pipe is either sending hydrogen, or some other gas depending upon the way the switching is done. Figure 3 gives a block diagrammatic description of claim #3. At the destination, the hydrogen is converted to energy and pure water by either a fuel cell or an engine that generates steam as a "wasteБ─². This pure water is a valuable by-product, especially in dry areas. Even otherwise, it is suitable for industrial use, and for the making of soft drinks. The claim relates to shielding the exhaust of the hydrogen to water conversion process such that there is minimal loss of water involved; and that water is collected in an appropriate container. If the exhaust is steam, it is condensed in cooling pipes. 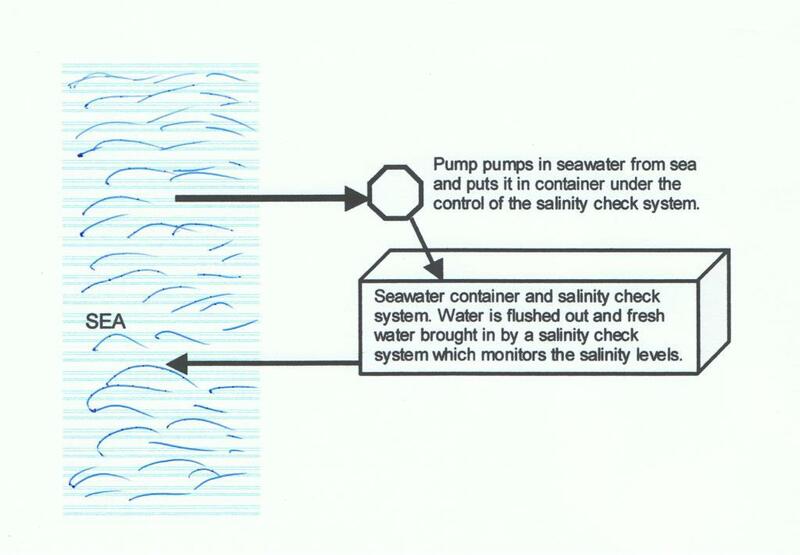 Figure 4 gives a diagrammatic description of claim #4, which is the end-part of the desalination system inherent within the functioning of the HTN. The installation of the HTN will be a major effort. Places of habitation will be linked with piping. This claim relates to adding telecommunications capacity (fibre-optic, coaxial, two-wire) depending upon the local exchange capability and taking future upgrades into account, along with the laying of the cables over the distances between the sources and the sinks for the hydrogen pipeline. Thus, two birds will be killed with one stone. The telephone lines could be tied to the hydrogen pipe with appropriate cable ties. Figure 4. Block Diagrammatic Representation of end part of the HTN desalination system. 1.Hydrogen Source (coal/oil/natural gas/solar/hydro/electricity grid/nuclear/algae/...) Electrolysis process/plant is required if hydrogen is to be made from electricity. 4.Inverter system to convert the DC to AC 220 V.
5.A local 220V electric supply network using standard technology. Every single aspect above relates to proven technology. Searches using Internet search engines will easily give the required links. We will go into these details below. Most hydrogen is produced by chemical reaction using fossil fuels, like coal or oil or natural gas. The Carbon portion is extracted by oxidation. One of the best-known methods is to pass steam over hot coal. Carbon monoxide and hydrogen are formed as a result. The lighter hydrogen is easily separated, or both gases may be used for fuel. When carbon monoxide is separated, it can be burnt to form carbon dioxide under controlled conditions - the heat from this combustion is used to heat up the hot coal. The carbon dioxide obtained from the above process can be released into the environment in a controlled way - or be used commercially as dry ice for storing perishables. Electrolysis is another standard method for producing hydrogen. An electric current has to be part through saline water (pure water does not conduct electricity) and hydrogen and oxygen are formed near the electrodes. Both can be collected for use easily. This is a very old method. It was used in India to produce hydrogen with the surplus electricity from the Bhakra Nangal hydro-electric project. Energy sources such as nuclear, hydro, solar, wind, tidal, geothermal: they all ultimately produce electricity which is supplied to the electricity grid, unless locally consumed. An alternative method proposed here is to convert that energy, either at the source or using the grid, to hydrogen by the electrolysis method. For West Bengal, both the chemical and electrolysis methods are suitable for the production of hydrogen. West Bengal is rich in fossil fuel reserves and hydro-electricity. West Bengal also has abundant water resources required for the electrolysis process for the creation of hydrogen. West Bengal already has an electricity grid, and electricity from the grid can be used to provide hydrogen by electrolysis. The 220 V AC is converted into low voltage DC, and electrolysis is used to produce hydrogen. The hydrogen produced is piped to the destination, as opposed to extending the electricity grid. The above proposal is expected to be a much more cost-effective solution, ideal in terms of non-pilferage, ruggedness, access to remote areas over hills and rivers, low maintenance, environmental friendliness, aesthetic appeal, lower installation costs, etc. Hydrogen plant by water electrolysis is widely used in the field of power plants, electronic industry, semi-conduct material factories, optical fiber enterprises, metallurgy, building material factories, atomic industry, space flight, chemistry, weather broadcasting station, medicine industry, etc. We have exported to Indian, Vietnam , Nigeria , Pakistan , Indonesia , Korea , Iran , etc. Hydrogen equipment by electrolyzing varies from 5 m3/h to 600 m3 /h, pressure from 0.5MPa to 5MPa. Our factory has gained ISO9001 certificate. We have gained many patents and our technical data reached world advanced level and some of them rank at the front of the world. Pipes are the most important and obvious elements of the HTN. 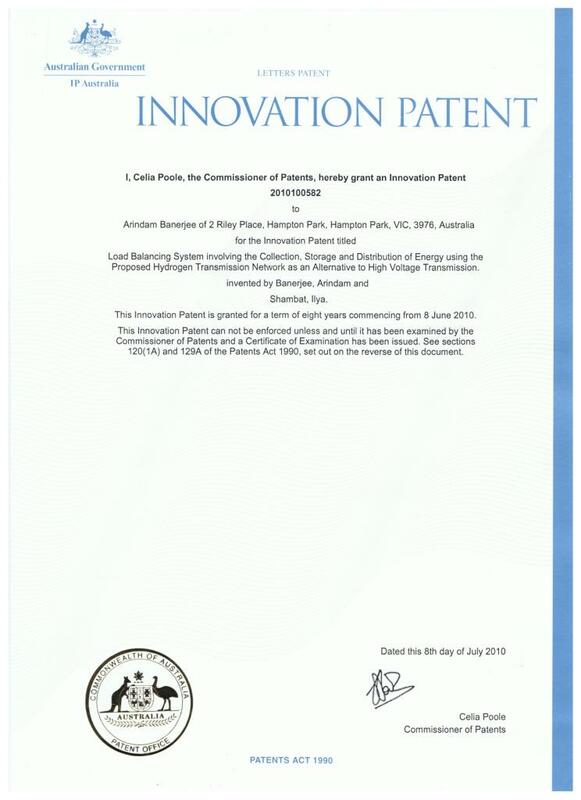 Knowing the importance of this HTN Research Pty Ltd (earlier, as Adda Enterprises) had entered into a collaboration with RMIT Melbourne for the purpose of investigating the practicality of Hydrogen Pipes. Prof. Satinath Bhattacharya, Professor in the Chemical Engineering Dept has authored a seminal paper on this. This is presented in Appendix 3. This paper states that with proper polymer lining, pipes can carry hydrogen without corrosion. 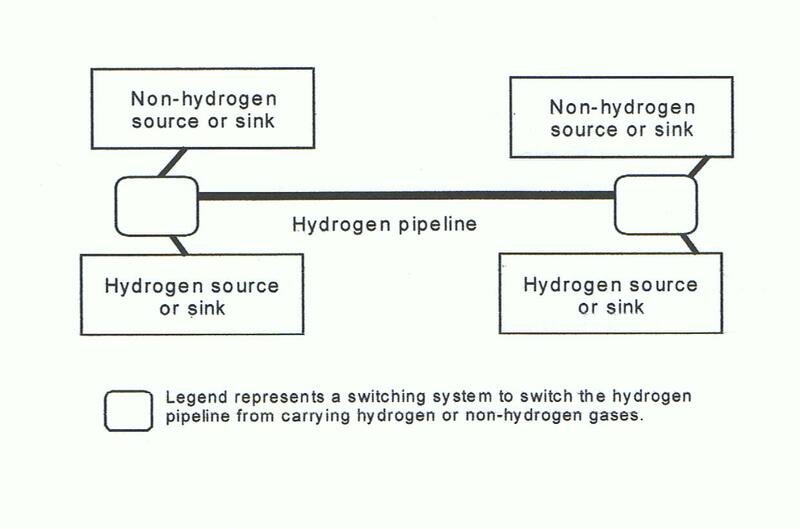 Thus, it is practical to use pipes to transfer hydrogen from sources to destinations. This is opposed to store-and-carry, the normal way to transport gases when pipelines are not available. Hydrogen has been piped for decades in Europe. The technology is thus tried and proven. The pressure need to compress Hydrogen gas is half as much less as it compress natural gas, as Hydrogen is a very light gas. It can thus "climbБ─² up hills, as there will be a suction effect at the outlet. However hydrogen is corrosive, so the extra care required to make the hydrogen pipe corrosion-free raises the cost of the hydrogen pipe by a factor of 1.5 to 2 as compared to the natural gas piping. Pipes will have natural advantages over the electricity grid, as mentioned earlier in the scope of the HTN. Its installation costs and maintenance needs should be much less than for the electricity grid, overall. Only the completion of the PPP and the ensuing costing analysis will give the actual rupee benefits, on a power/kilometre basis also taking into account ongoing maintenance activity. We might add here, that gases other than hydrogen (such as natural gas, coal gas, oxygen, nitrogen, carbon dioxide, etc.) can be piped using the HTN. Thus, natural gas could be piped in, and that converted to hydrogen. Oxygen, too, could be piped to destinations for various uses. One of the major United States' hydrogen providers Air Products plans to construct a new 290 km pipeline to connect its existing Louisiana and Texas hydrogen pipeline systems. The newly integrated pipeline system will unite over 20 hydrogen plants and over 966 km of pipelines to supply the Louisiana and Texas refinery and petrochemical industries with over 1 Bcf/d of hydrogen. The new Gulf Coast hydrogen pipeline network is expected to be operational in mid-2012. Hydrogen is widely used in petroleum refining processes to remove impurities found in crude oil such as sulphur, olefins and aromatics. Removing these components allows gasoline and diesel to burn cleaner and makes hydrogen a critical component in the production of cleaner fuels needed by modern, efficient internal combustion engines. The following article easily found from the Internet gives a good insight about the viability for piping hydrogen gas to various destinations. We see that most hydrogen pipes are less than one inch in diameter, and a special PVC-type pipe within steel tube can easily do the job. Thus, indigenous production of hydrogen pipes is feasible. Even a 7 mm diameter tube can carry enough hydrogen to supply a village! While one day it will be possible to replace high power electricity tranmission with the HTN, for our pilot plant project we can do with providing overall a one-inch steel tube with polymer (PVC lining) that will carry the hydrogen. We will find that this is really a very cheap, easy, quick, rugged solution to provide power to remote areas. The above article in Internet deals with the chief problem with Hydrogen - storage. Liquid hydrogen is expensive to store, and compressed hydrogen needs a high volume for storage as hydrogen is a very light gas. We have to understand here that these issues, so important for the Western developed world, are non issues. Hydrogen's main purpose there is for use on mobile platforms such as cars and buses. Large fuel tanks are inconvenient. However, they have already done a lot of work in making hydrogen tanks work, large though they are. Size is not an issue in the use of hydrogen tanks in the HTN, for the hydrogen tanks will remain stationary. The generation of hydrogen from the sources is likely to be erratic. Also, the demand or consumption of hydrogen will not be constant. To make it possible for a steady supply of hydrogen is available to the consumer at all times, buffering of hydrogen, or storing an adequate amount of hydrogen to be used when there is excess demand, or low supply, is essential. The amount of buffering required will depend upon the needs, and only experience can dictate the actual amount. However the technology has to be in place. So, the hydrogen generated at the source is put into a storage area, under compression. It is from the buffer storage that the hydrogen is sent to the pipe in the HTN. Similarly, at the receiving end, there may be (optionally) a buffer present to take into account the times when the buffer in the sending area may become empty, so no hydrogen can be sent down the pipe. (Or some other gas is being sent through the pipeline). Thus the pipes may be pressurized with hydrogen for most applications, but could be free from any gas for other operations that would involve the future passing of any non-hydrogen gas through that particular pipe. Compression systems are required to compress the hydrogen gas from the source to the buffer. From the buffer to the pipe, suitable pressure regulation is also required. While the initial high pressure in the buffer storage (as seen above upto 700 bar) is more than sufficient to push the hydrogen gas to its destination if that is within a reasonable limit (say 100 Km) intermediate systems to collect and re-compress the gas may be necessary for very long hydrogen gas pipelines. While this is a normal part of hydrogen gas piping, it deserves special mention as a necessary component in the HTN system. Mr.Arindam Banerjee has developed a conceptual framework for the creation of a hydrogen economy in the Australian context. His report analyses the potential benefits of a hydrogen economy(economic and environmental). It highlights the fact that Australia could not only meet its increasing energy demands but at the same time become a world leader in taking initiative to move towards green technologies for energy generation and consumption. Since hydrogen storage is a challenge the above mentioned idea directly looks at use of piping network for transportation of hydrogen. Based on this novel framework developed by Mr. Banerjee the following report looks at the technical challenges associated with making the hydrogen economy a reality. The Hydrogen economy is one of the probable green technology based solutions which could replace the oil driven economies looking at future environmental concerns. Scientifically an optimized hydrogen economy would operate with zero carbon emissions and produce soft water as a by product making it an lucrative solution. This fact is further validated by the amount of funding allocated for the development of a hydrogen economy globally. A lot of technical and economic challenges exist before the concept of a hydrogen economy can be put to commercial use. The following review outlines various project stages involved in making the hydrogen economy a reality in the Australian context. 2)Design of a piping network for transportation of hydrogen in gaseous or in liquid form Design of valves and compressors for transportation of hydrogen. 3)Design of valves , compressors and sensors for transportation of hydrogen. 5)Cost optimization studies to make the project as cheap as possible. There are three basic procedures for generation of hydrogen they are Electrolysis by use of direct current, generation of hydrogen via a fuel cell and finally generation of hydrogen from fossil fuel sources. Among these technologies direct route electrolysis is energy intensive compared to others but at the same time is pollution free. The generation of hydrogen by fuel cell technology (microbial sources can be used) is cost effective but the power generation rate is comparatively lower as compared to direct electrolysis. Finally the last method is to use fossil fuel sources which is relatively expensive as compared to fuel cell technologies and has higher carbon emissions as well but it provides a relatively stable throughput. The procedure for generation of hydrogen would be actually a optimized mix of all the three mentioned technologies with cost, geographic location, and carbon emission as boundary conditions for a optimization problem. Also further research and development in this area could lead to improvement in efficiency and throughput rates for fuel cell technologies resulting in economies of scale with respect to fuel cell technologies. The piping of natural gas using steel pipes is a well known technology. A lot of research has been put in to understanding the economics of piping of hydrogen using existing technology. The literature suggests that the piping of hydrogen is going to at least 50% more expensive as compared to natural gas due to the following reason. Firstly Hydrogen is more corrosive as compared to natural gas. The problem of hydrogen embitterment due to hydrogen corrosion and documented .So the cost of hydrogen resistant pipes is going to costlier using conventional technologies for transportation like say steel pipes. Secondly special fittings and valves have to be designed using the conventional piping mechanism to eliminate hydrogen permeation which would further increase the cost. Finally handling of specially designed pipes and valves would result in increased labour costs which would further add on. It has been proved in the literature that the major cost in laying a piping network is the labour cost and hence is an important factor. There are other possible research alternatives to eliminate this problem and make the piping of hydrogen more sustainable and cheaper probably comparable or even cheaper as compared to pumping natural gas or other fuel gases. The possible research in this area will be discussed later in the report. Also the cost of pumping hydrogen like other forms of energy is dependent on the geographic location and the demand which result in economies of scale. The design of valves, compressors, connecting ports and sensors are very important for the use of a piping network in an hydrogen economy. The reason being that the use of special materials for hydrogen transportation would require special accessories as well. Further the sensitivity of the valve also needs to be optimized as per the energy load. The current gas compressions systems need to be modifies considering the corrosive nature of hydrogen as compared to natural gas or steam. Also the liquefaction of hydrogen will take place at much higher pressures and lower temperatures changing the overall efficiency of the compression cycle. Hence design studies of the accessories to be used are very important for the success of a hydrogen economy. It has been known since ages that the Carnot cycle is the best thermodynamic cycle for generation of energy and hence is the bench mark for any kind of thermodynamic studies. The reason being that a Carnot cycle is a completely reversible cycle and operates infinitesimally slowly maintaining reversibility of the process at every stage. All other commercially used energy cycles cannot be operated so slowly and are not completely reversible. Hence the efficiency of any other commercially used energy generation cycle will always be lesser than an idealized Carnot cycle. The conversion efficiency of a fuel cell under idealized conditions can be higher or equal to Carnot cycle but the overall efficiency of energy conversion i.e. hydrogen - electricity -hydrogen can never be greater than a idealized Carnot cycle. Though there is sufficient literature in this area the claims need to be verified experimentally. Also further studies on the conversion efficiency of hydrogen - electricity - hydrogen need to be calculated experimentally and suitable thermodynamic models need to be developed before actually commercializing. The generation and supply of hydrogen has to be cost effective in the sense approximately at least equal to the case of a gas electricity generation system to make it economically competitive. Also the additional benefits of using hydrogen as compared to conventional technologies will make the proposition even more effective. The key to cost optimization is to develop and select suitable technologies for generation and transportation of hydrogen. The possible research projects to reduce the generation and transportation cost of hydrogen will be discussed further in this report. Proposal 1: The design of hydrogen transmission piping networks using polymer nanocomposites. The transmission of hydrogen using conventional steel pipes is not a viable solution since hydrogen is highly corrosive (hydrogen embrittlement). Also the rate of permeation of hydrogen from the conventional pipes is very high. The cost of laying specially designed steel pipes is very high making hydrogen transmission uneconomical as compared to natural gas. Development of reinforced polymeric composites with reduced permeability is a good alternative to be used .The use of such composites will not only eliminate the problem of hydrogen corrosion and embrittlement at the same time make it cost effective and comparable to that of natural gas transmission. Such a kind of project has been taken up by the Argonne research lab in USA.Once a suitable material is selected then a piping network design can be made and sensors can be incorporated in to the system to monitor flow rates and pressure of hydrogen inside the pipes .Once the piping network has been designed then hydrodynamic and thermodynamic modelling of hydrogen flow through the pipes becomes very essential since this will help in determining the suitable points for installing compression ports . Also further work would be to incorporate valves and joining ports with in the piping system. Then this network can be used commercially. H. SHIGA, K. SHINDA, K. HAGIWARA, A. TSUTSUMI, M. SAKURAI, K. YOSHIDA and E. BILGEN* "LARGE-SCALE HYDROGEN PRODUCTION FROM BIOGAS" Int.Journal.of Hydrogen Energy, Vol. 23, No. 8, pp. 631-640, 1998. Marianne Mintz, John Molburg, Stephen Folga, Jerry Gillette, "Hydrogen Distribution Infrastructure" , Argonne Research laboratories.